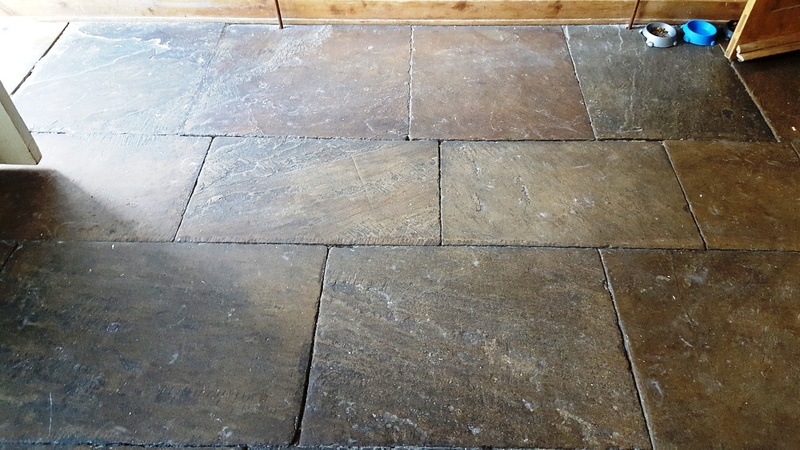 A customer from Colne near Burnley was absolutely frustrated with their newly installed Sandstone floor in the kitchen of their farmhouse. Ever since it was installed it had proved impossible to keep it clean. 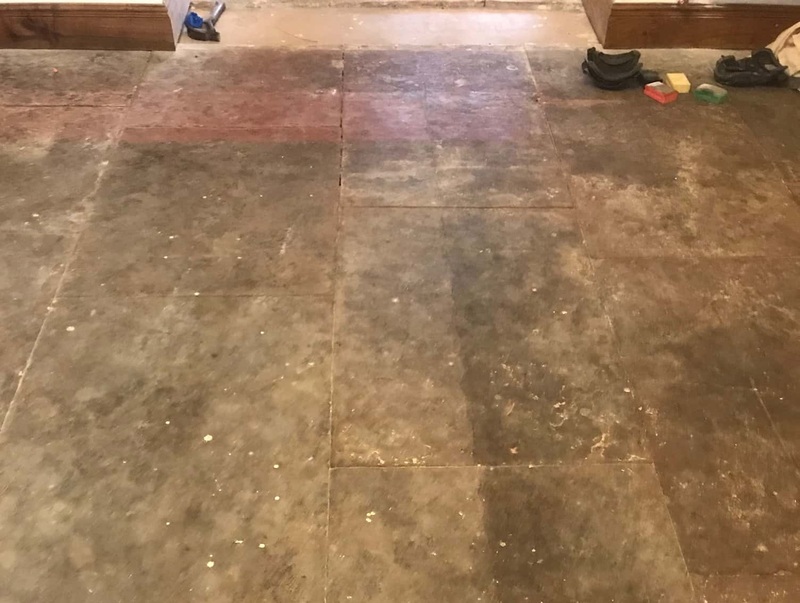 The customer contacted Tile Doctor in the hope that we could remove the ingrained dirt and make the floor much easier to maintain going forward. I went over to inspect the floor and recommended a course of action. There was a section of stone which had a stain on it due to a pet accident, so we chose area to conduct a test clean. 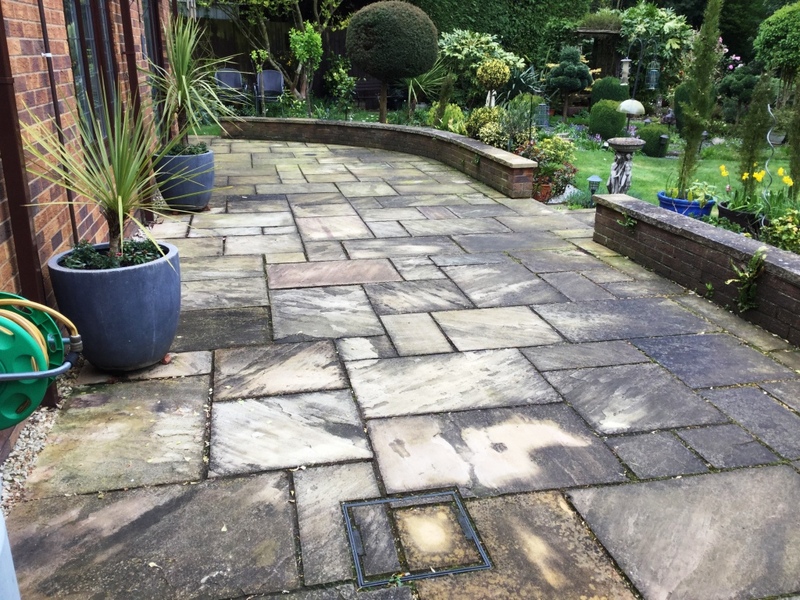 The flagstone responded well to the cleaning process which impressed the customer who booked us in for the job. There were happy to go ahead with my quote and quite relieved that she had finally found a solution. Arriving on day one, first I taped up the plinths and skirtings to ensure they were not marked during the cleaning, especially as the kitchen was newly installed. 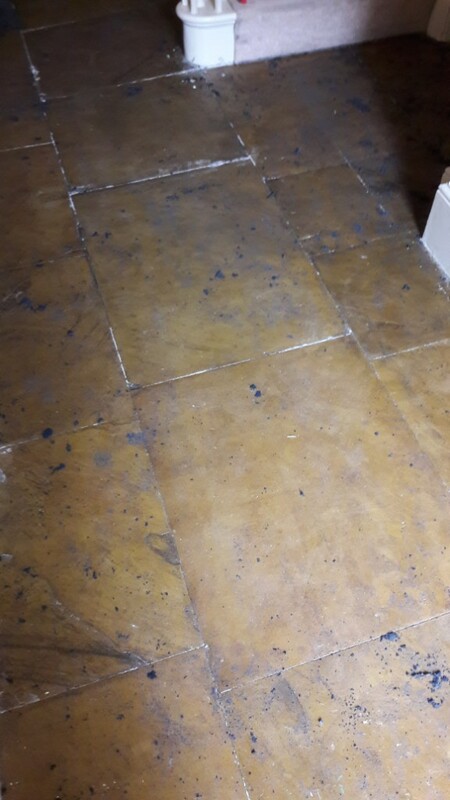 Then, to deep clean the floor and remove the ineffectual coating applied by the installer I applied a strong dilution of Tile Doctor Remove and Go and let it soak in for about ten minutes. The solution was then worked into the stone using a coarse 100-grit milling pad. This coarse pad was then followed up with the application of a finer 200-grit pad. Together these pads resurface and clean the stone and remove the coarse surface that was trapping dirt so easily. The pads are applied with water which lubricates the abrasive action and results in a fine slurry that is rinsed off after each pad. The slurry is then extracted with a wet vacuum, keeping the mess to a minimum. 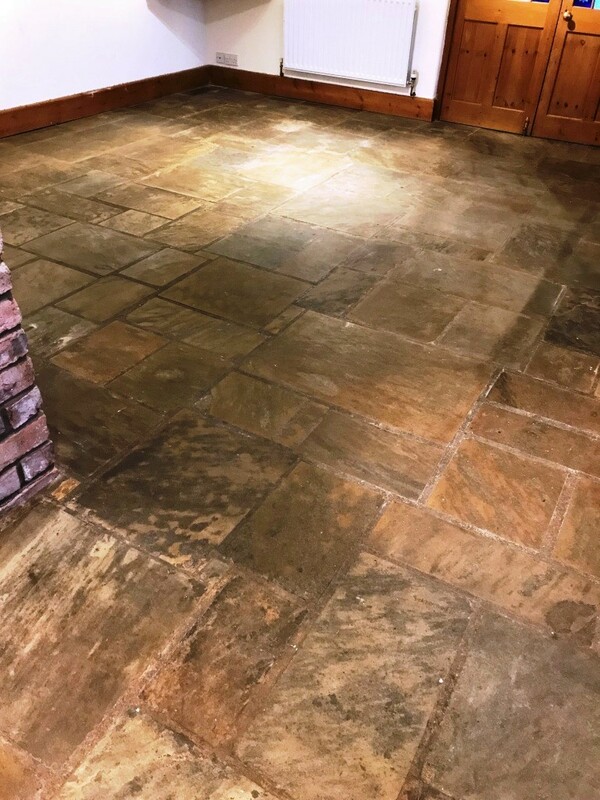 The flagstone floor was then given a quick acid wash with Tile Doctor Grout Clean-Up to clean the stone further and counter the alkaline cleaning product applied during the first stage of cleaning. After a further rinse with water and extraction with the wet vacuum the floor was left to dry off overnight. Returning the following day, the floor was first checked using a moisture meter to ensure it was dry. 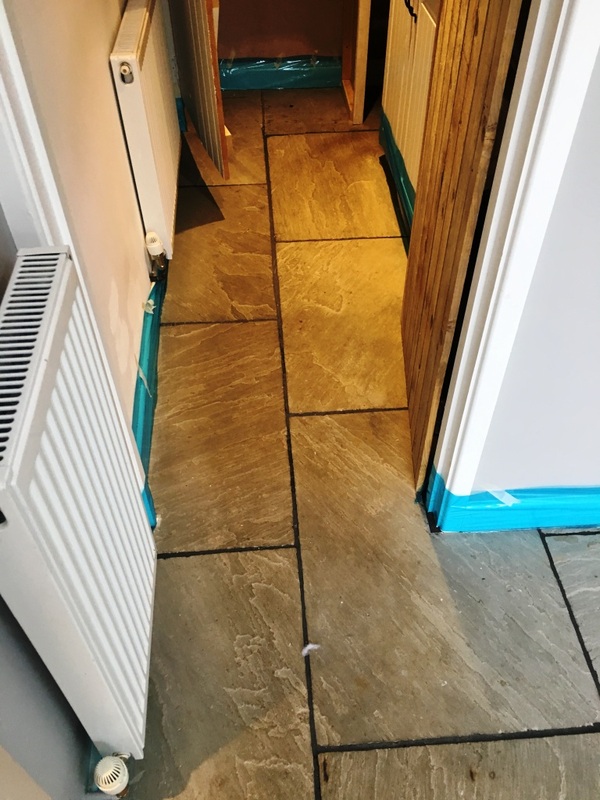 We then sealed with multiple coats of Tile Doctor Seal and Go which added a nice subtle sheen to the stone and as well as protecting the stone from staining ensuring it is a lot easier to clean going forward. 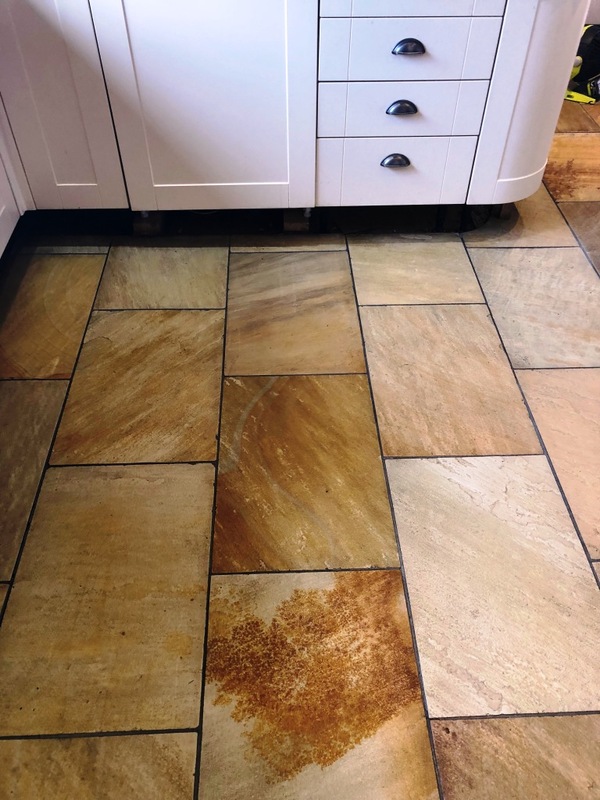 I recommended they should use the Tile Doctor Neutral Tile Cleaner, which is pH neutral so it will ensure that the sealant is not compromised during cleaning. This is a concentrated product so only a small amount is required, so a small bottle goes a long way. The client was delighted with the floor and very relieved that it now looked exactly as it should. 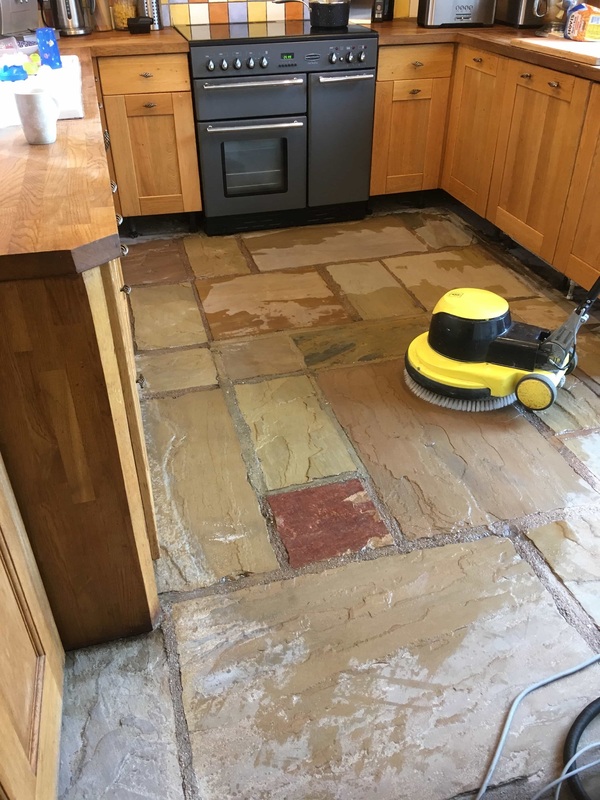 We were contacted by a family in the Barnsley area of South Yorkshire who were tearing their hair out trying to keep their Sandstone Tiled floor clean. The kitchen area was especially grubby and once the island had been removed during recent renovations, the dirty floor really stood out. The house was located on the Northern tip of Barnsley in Mapplewell, close to the border of South and West Yorkshire, an area which is steeped in coal mining history. Even though all the coal mines have gone there’s still lots of evidence of its’ proud mining history in the area. 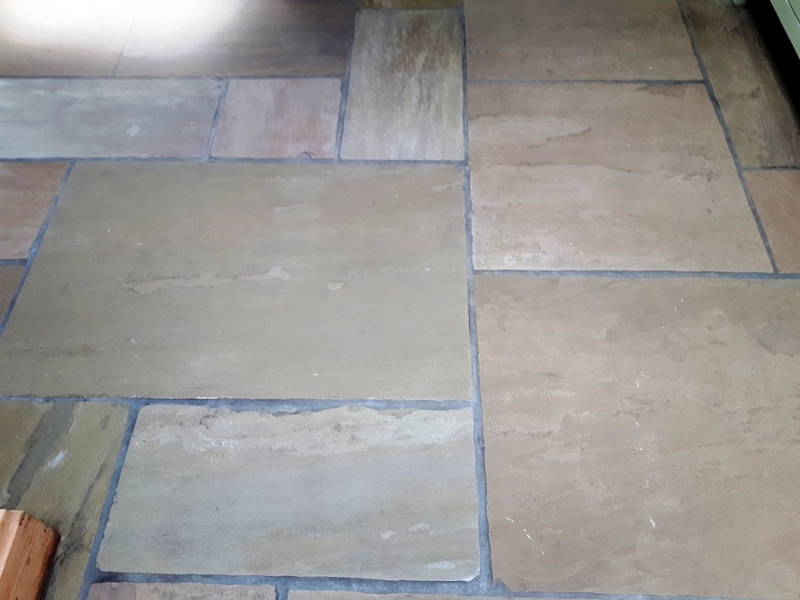 After inspecting the tiles, I could see their problem revolved around the fact that the Sandstone had a texture to it and the previous sealer used was an impregnating sealer, as a result the dirt had no problem sticking to the stone as you can see from the picture. 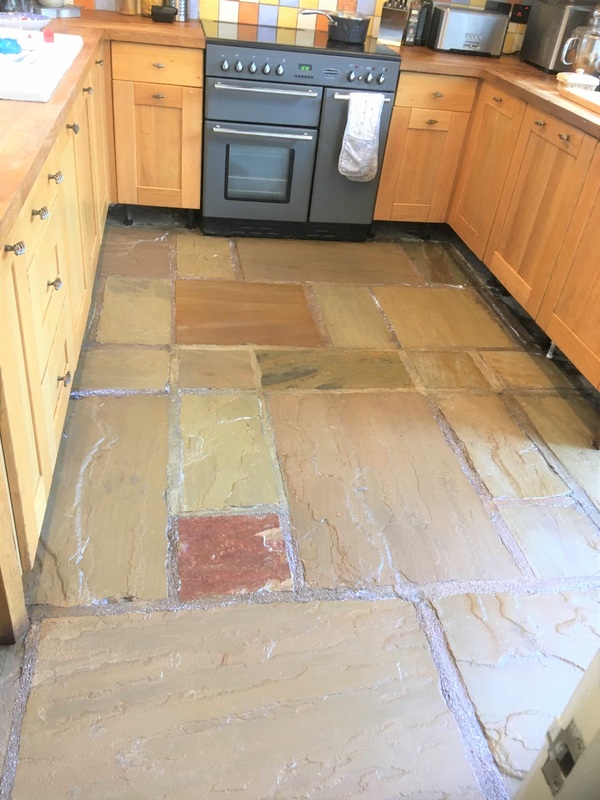 At Tile Doctor we see Sandstone/flagstones used a lot as Kitchen flooring, it is a popular choice due to it being so hardwearing, however as with any natural stone it needs to be sealed to protect it and bring out its beauty and colour. I demonstrated the cleaning process on a small part of the floor, which they were very satisfied with. The testing also enables me to understand what it would take to renovate the whole floor and provide them with an accurate price. They were happy with my proposal and keen for me to begin the work which would take two days to complete, one day to clean the floor and returning a further day to complete the sealing of the floor. On arrival at the agreed date I set about preparing the working area by removing the kickboards and protecting other surfaces that might come into contact with the cleaning products and equipment. 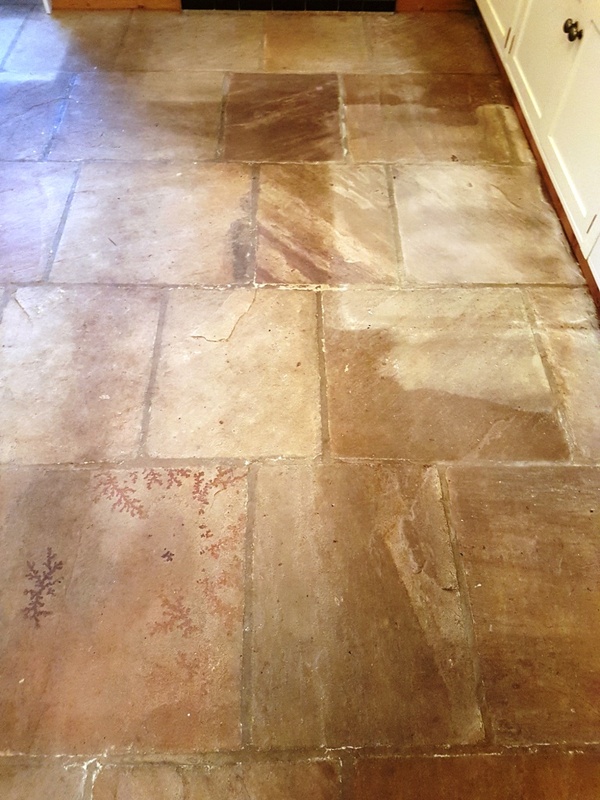 My process for cleaning the floor was to spray the floor first with a strong dilution of Tile Doctor Remove and Go which was left to soak into the stone for ten minutes so it could breakdown old sealers and dirt. 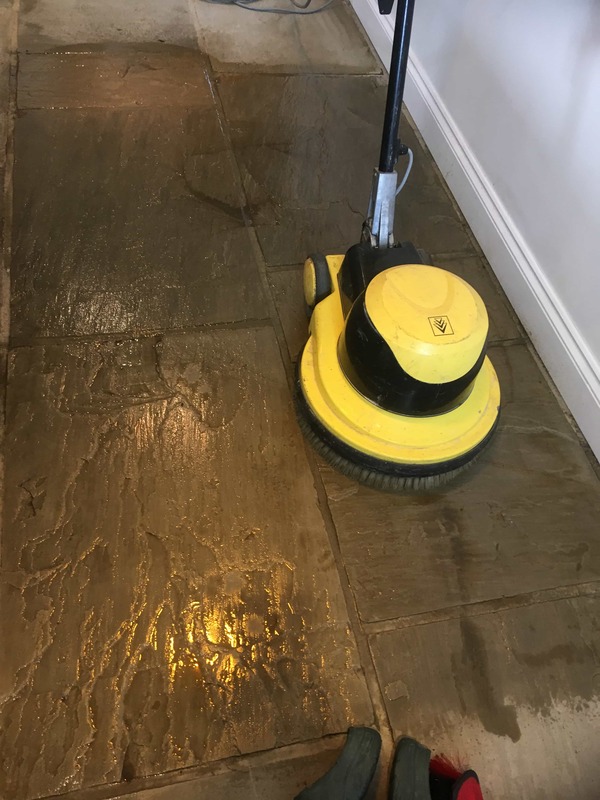 The solution was then scrubbed into the stone using a rotary floor buffer fitted with a 400-grit diamond encrusted burnishing pad. 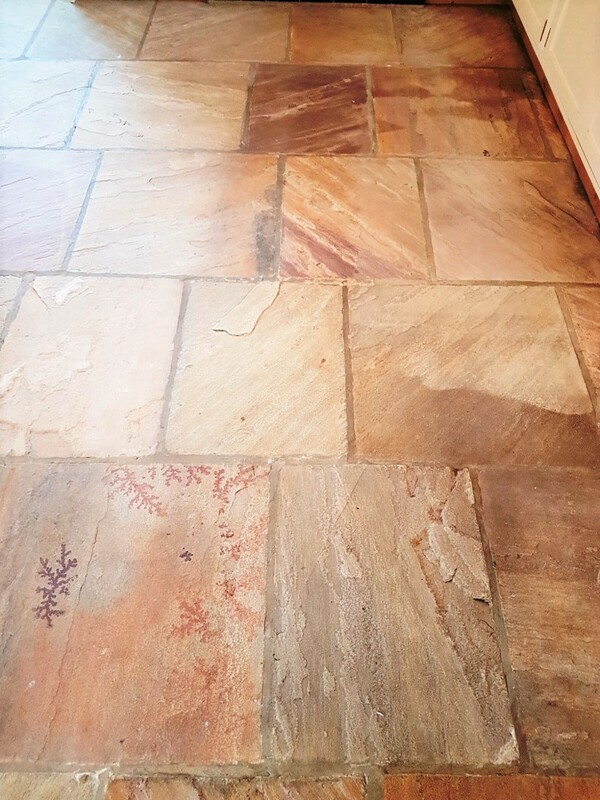 It didn’t take long for solution to turn grey with the soil that was released from the floor and the true beauty of the Sandstone started to appear. The dirty slurry was extracted with a wet vacuum and the floor given a thorough inspection. 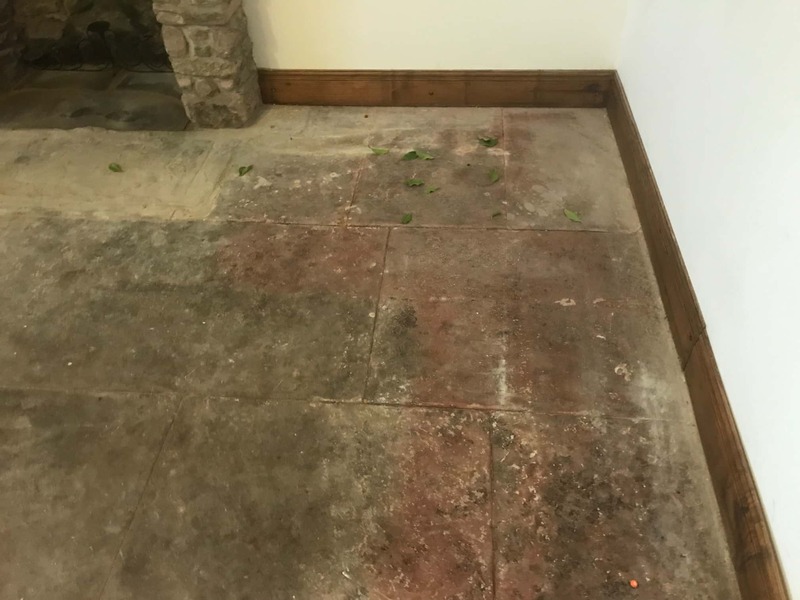 Stubborn stains were spot-treated using the same process and once I was satisfied the floor was given a thorough rinse to remove any trace of cleaning product and dirt. The floor was dried as much as possible with the wet vacuum and then assisted with fans left to dry off fully overnight. It was clear to me at this stage that the floor was already showing significant improvement. The next day I tested the stone for moisture using a damp meter to ensure it was dry before sealing. It confirmed that the floor had dried overnight and would be able to start applying the sealer. 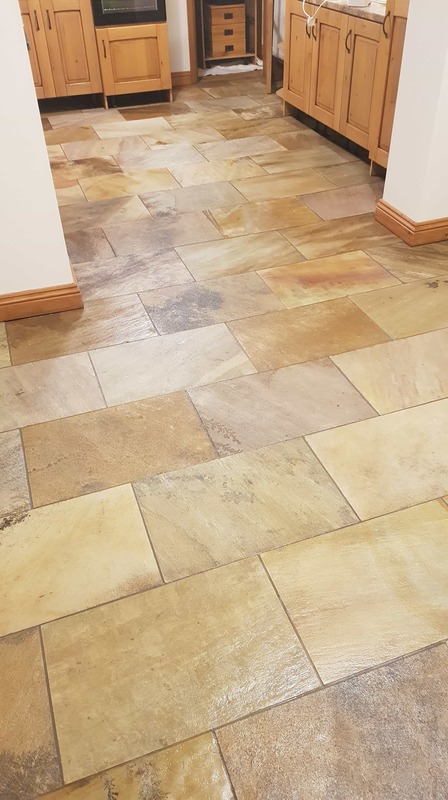 It was already clear that an impregnating sealer was not the best choice for a textured stone so a topical sealer would be the best option, not only does it bring out the colours of the stone it also adds a barrier between the fine pores of the stone and dirt. Six coats of Tile Doctors Seal & Go were applied to ensure the stone was fully sealed, which took some time as you have to wait for the first coat to dry before applying the next. Seal and Go is a water based acrylic satin sealer which is perfect for this type of floor. It gives a nice natural finish but allows the natural colour and beauty of the floor to shine through. 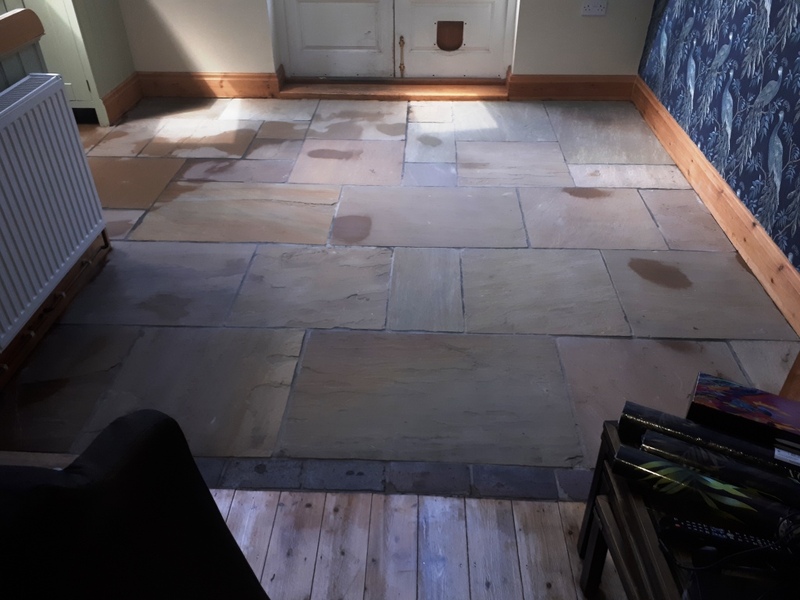 The sandstone now looks much lighter and cleaner, certainly my client was very happy with the transformation of the floor, especially where the island had been. In fact, we have agreed with the customer we will return every year to maintain the floor to keep it looking in perfect condition. In the meantime, they should be able to easily keep it clean using Tile Doctor Neutral Tile Cleaner which is designed for the regular cleaning for sealed floors like this. 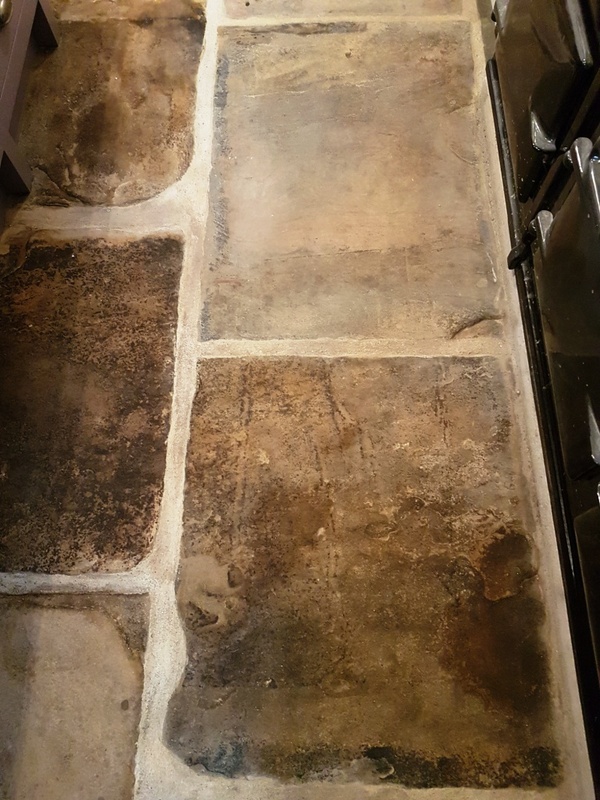 The stone floor in the pictures is an Indian Fossil Sandstone which had been installed in the Kitchen of a house in the North Yorkshire market town of Thirsk. 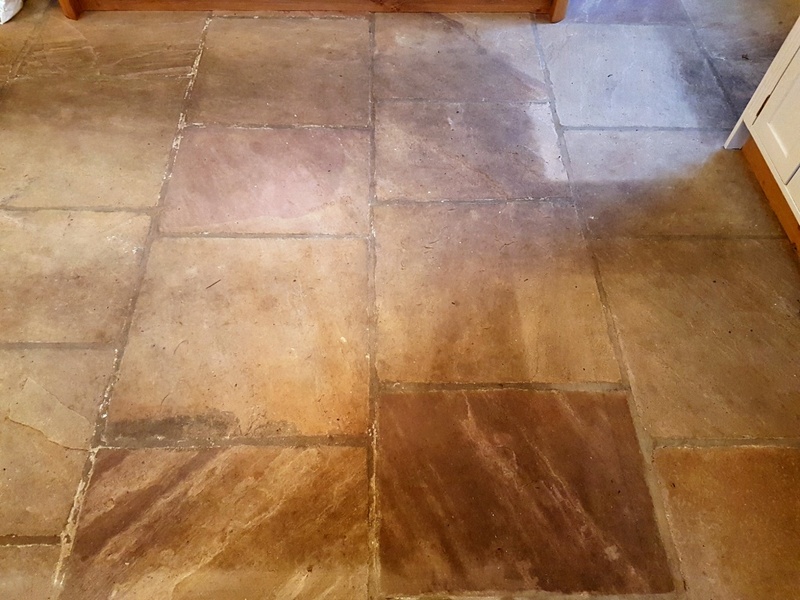 The Sandstone tiles had not been professionally cleaned and sealed for ten years so and was now overdue a deep clean. The customer had tried cleaning it but gave up and give me a call instead as no matter what she did nothing seemed to make a difference. 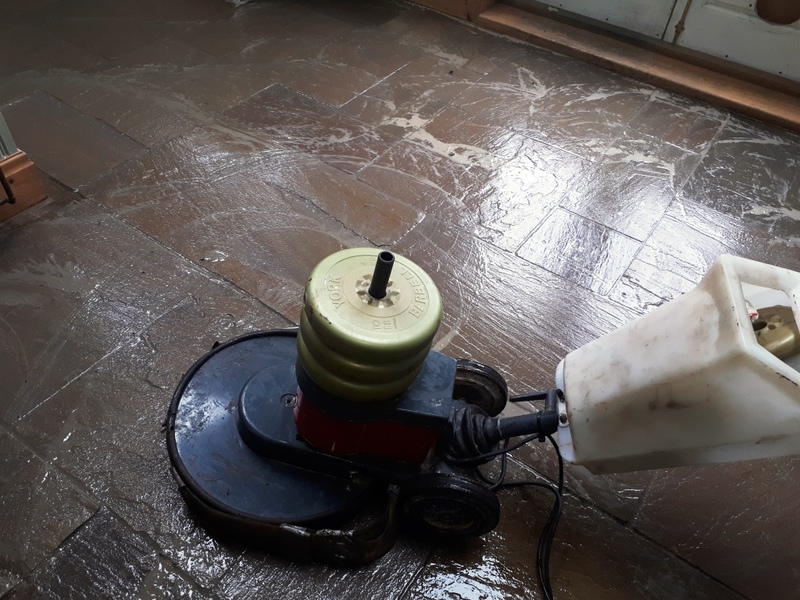 They had been using numerous household cleaners to maintain the floor which doesn’t help as many supermarket cleaning products are too strong for use on a sealed floor and will prematurely reduce the life of the sealer. 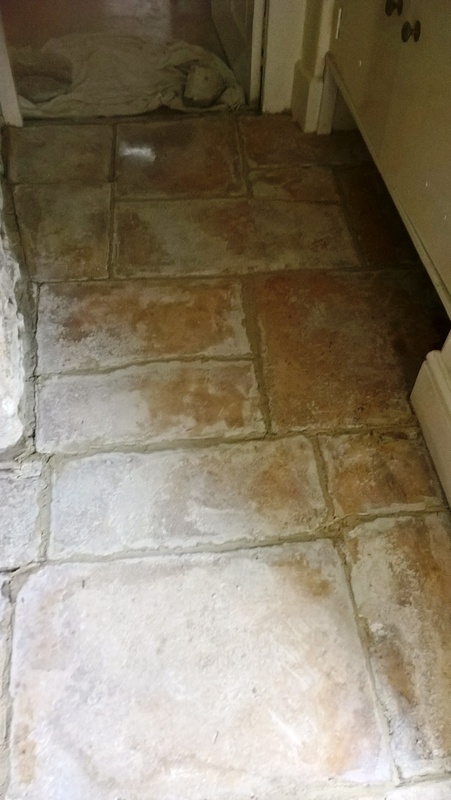 Without the protection of a sealer dirt becomes ingrained in the stone making it very difficult to clean effectively. 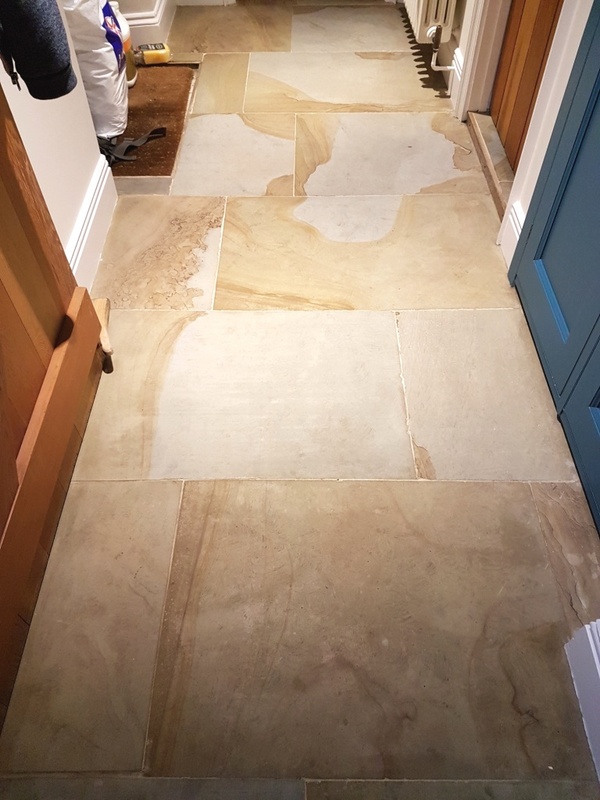 Another problem was that the Sandstone tiles were very uneven and rough in texture, so the dirt was getting caught in the bumps which didn’t help. 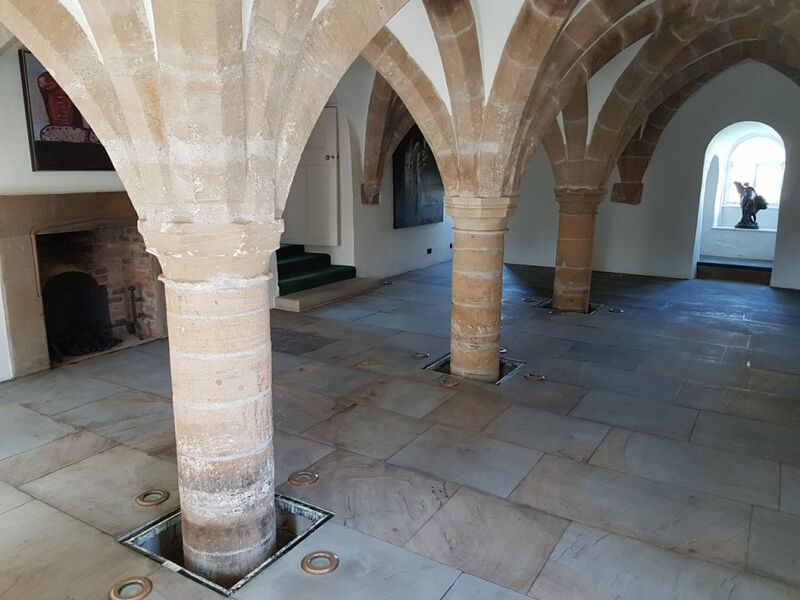 I went over to the property in Thirsk to survey the floor and conduct a test clean, so they could see how the stone would look on completion. 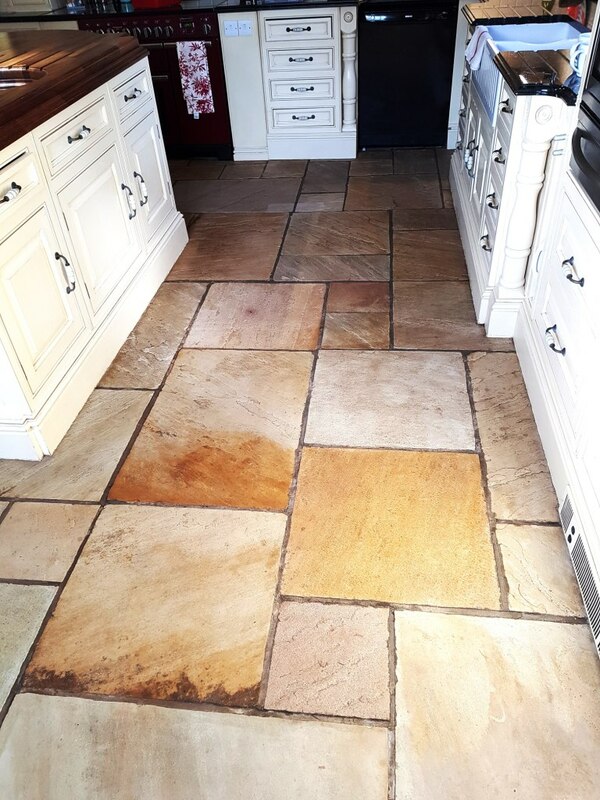 The Sandstone responded well to treatment and we agreed a date for me to return and complete the floor. 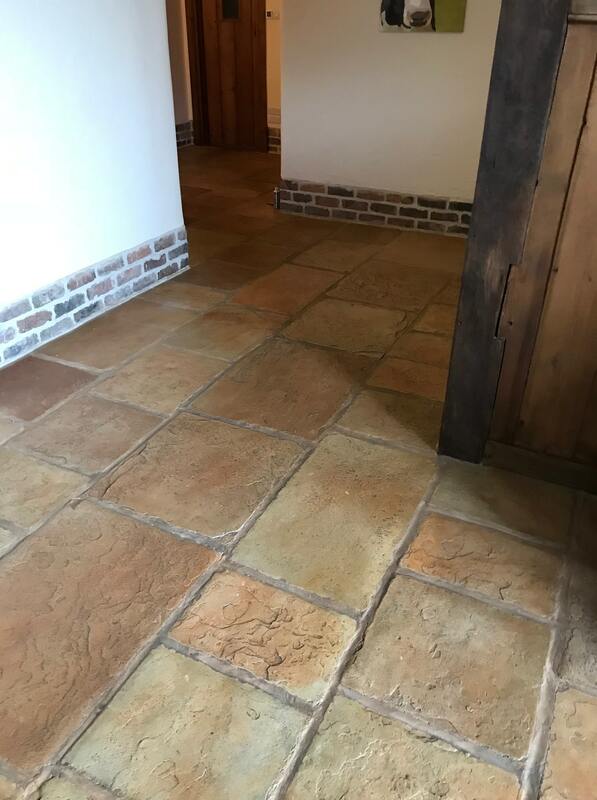 Maintenance issues aside Sandstone pavers look great in a Kitchen where they give a rustic farmhouse appearance that brings the outside in. 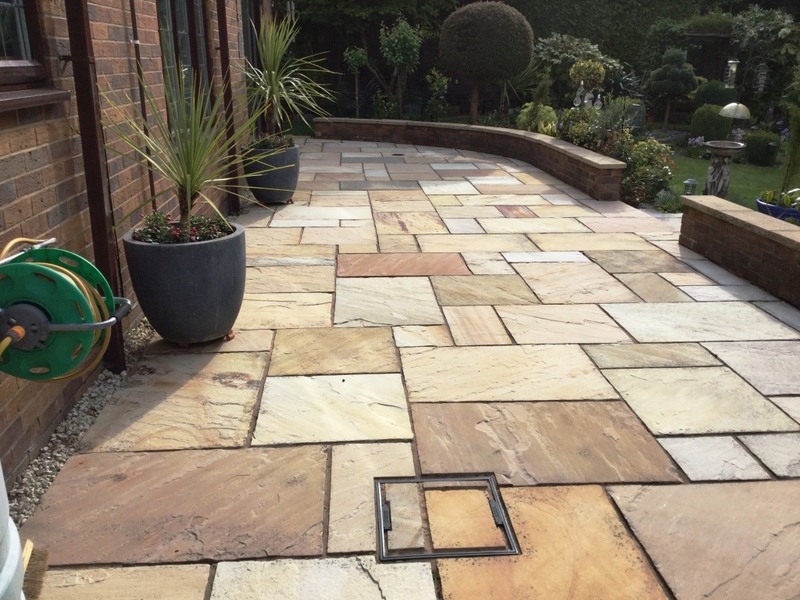 Imported from India, Indian Fossil Sandstone is full of character and with prices from around £19m2, very affordable. 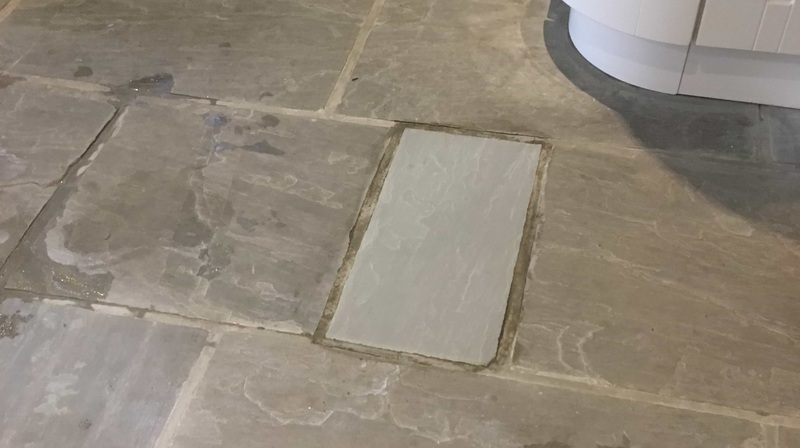 Due to the thickness of the stone we wouldn’t recommend using pavers with under floor heating. 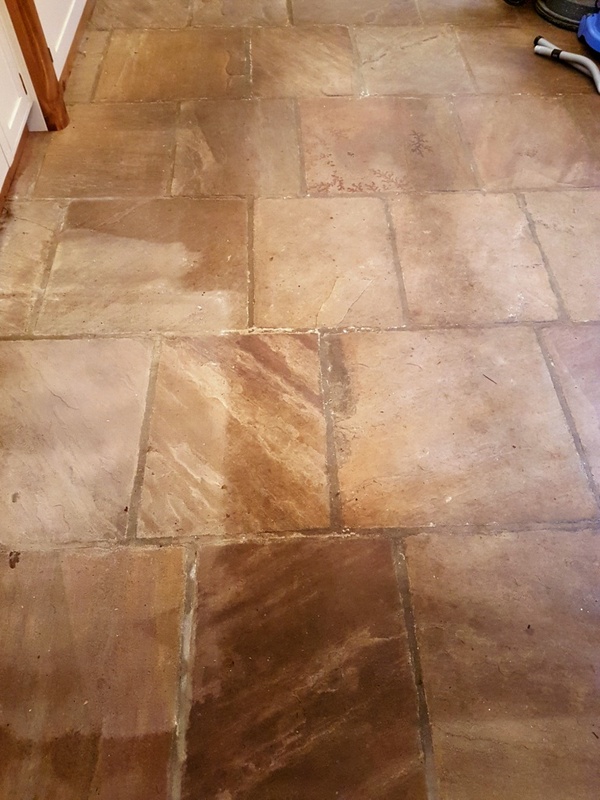 To get the stone clean and remove what was left of the sealer I applied a strong dilution of Tile Doctor Pro-Clean and allowed it to soak into the tile for about ten minutes before scrubbing it in with a black pad fitted to a rotary floor buffer. This removed a lot of the dirt and stains however floor pads struggle on uneven surfaces, so I found that to get the stone and grout really clean I had to rescrub most of them by hand. The soiled cleaning solution was then rinsed off with water and extracted with a wet vacuum. 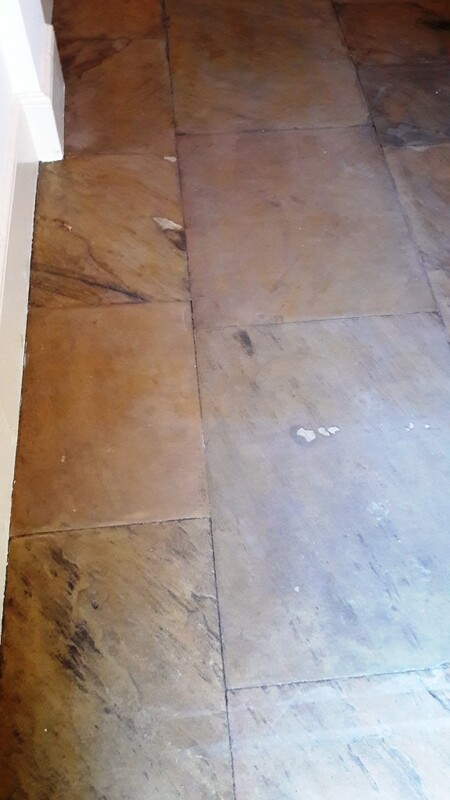 The floor was then inspected, and any stubborn areas retreated using the same process and more Tile Doctor Pro-Clean. The floor was then left to dry off overnight in preparation for it being sealed. I returned the next day to finish the renovation. First, testing the floor with the moisture meter to ensure it was dry enough to take the sealant. I started by applying two coats of Tile Doctor Ultra Seal which will protect against ongoing dirt and stains. 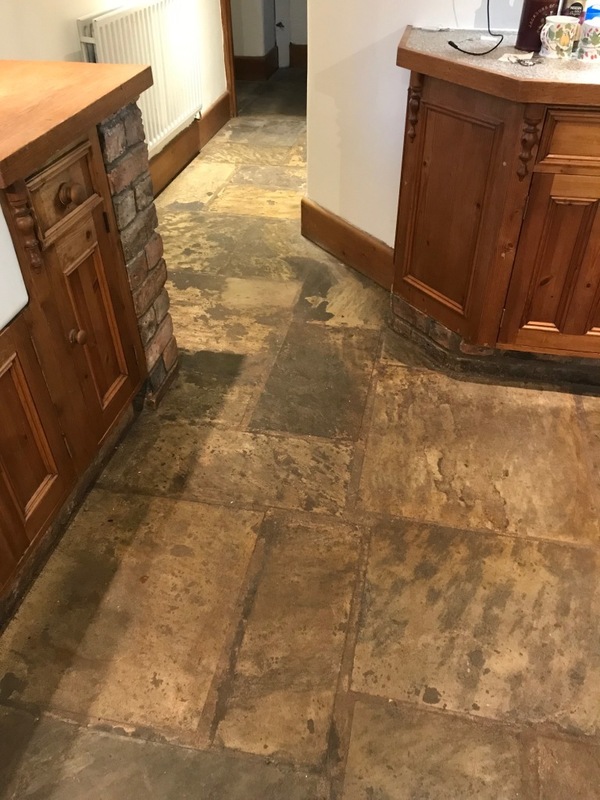 You can always tell when stone floor has had enough sealer applied by adding a droplet of water to the tile, if it forms a bubble on the surface then you know its sealed. I demonstrated this to the customer, so they would know in future and could give us a call when they needed to redo the floor. As before the Sandstone responded well to the treatment leaving it much cleaner and lighter in appearance. The floor had a lovely variety of colours and you could now clearly see the fossils trapped in the stone. 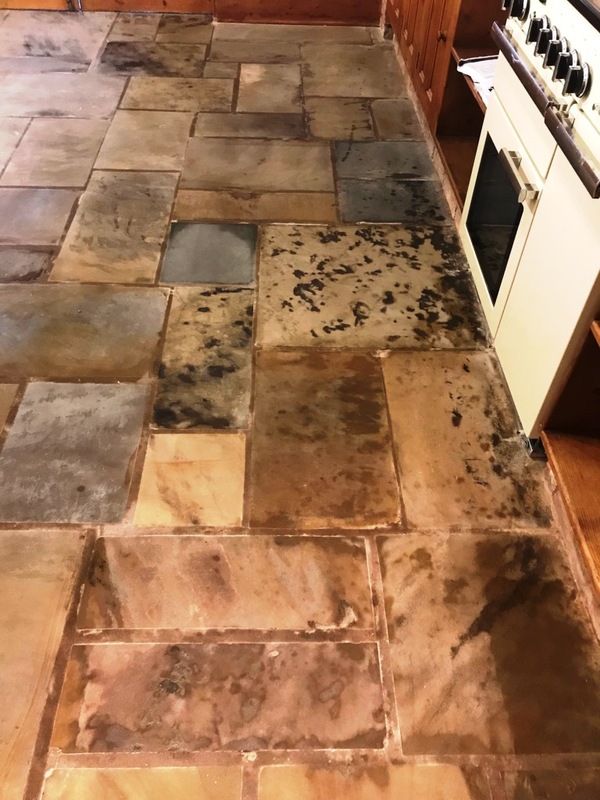 Before leaving I recommended that they use a pH neutral cleaning product going forward such as Tile Doctor Neutral Tile Cleaner which is specifically designed for cleaning sealed floors and will help keep the floor maintain its appearance. My customer was amazed at the transformation and left the following feedback for me. 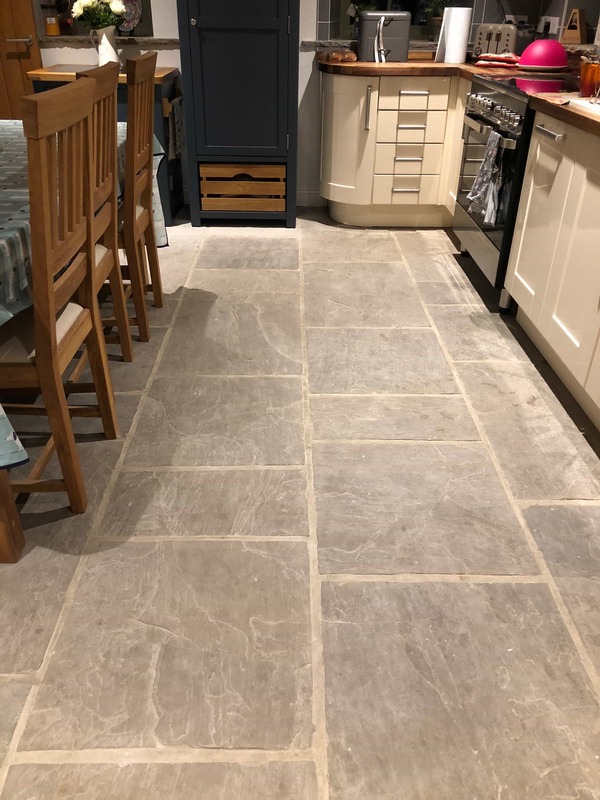 The pictures below show a Rough Textured Indian Sandstone floor installed in the Kitchen and Hallway at a property in Bernoldswick which is a small town just outside the Yorkshire Dales national park. The client called us out to have a look at their floor which was very dirty. They were undecided as to what to do with it and were even considering ripping it up and putting a more practical floor down. 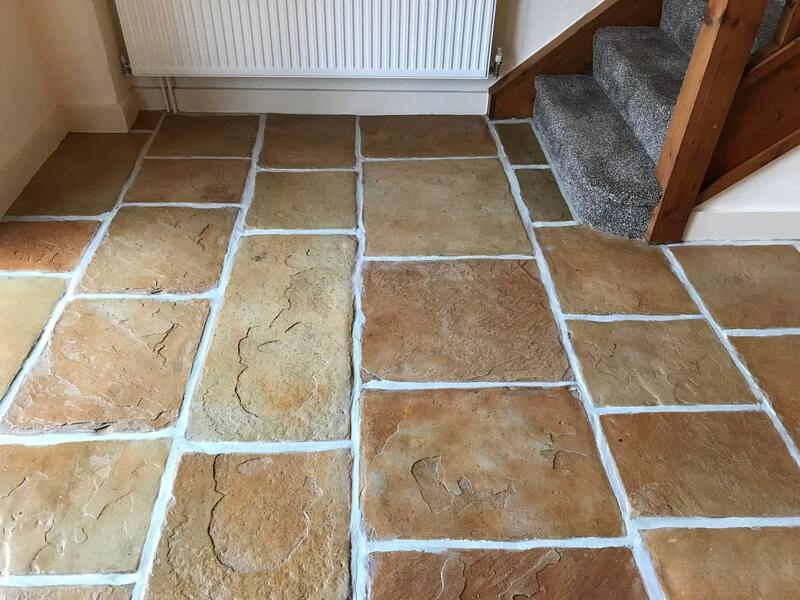 This Sandstone has a rough texture which traps dirt and can shred mops making it very difficult to maintain so it’s not surprising that the client was close to giving up on it. 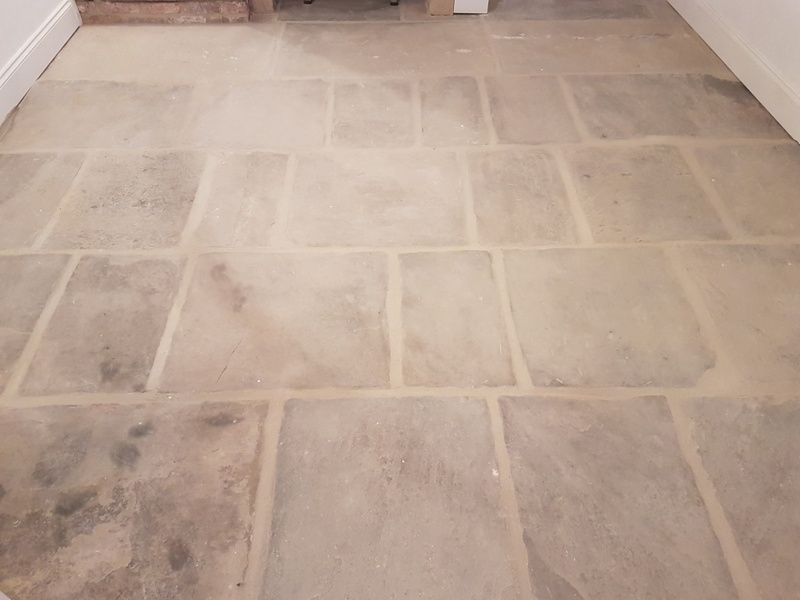 Initially we were asked just to deep clean and seal the Stone, but I realised that wouldn’t resolve the problem completely, so I offered a service we call Milling. This is a process involves applying coarse diamond pads with special machinery to remove a good chunk of the rough texture (about 80 to 85% ). It would leave the stone with a much smoother finish which is easier to keep clean, easier to seal and a lot easier to maintain in the future. After a demonstration was done and a price given for either a clean and seal or to Mill first followed by a clean and seal the customer opted for the latter. 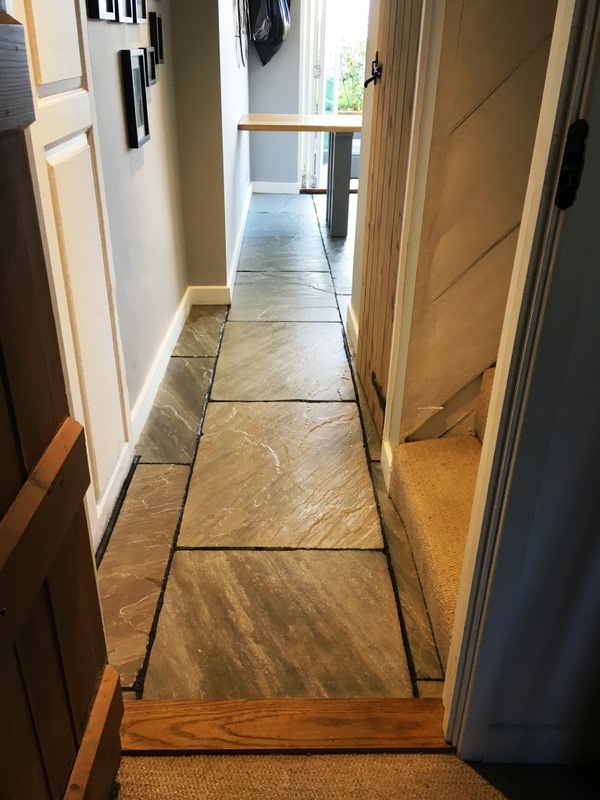 This would also prove significantly cheaper than ripping up the floor, hiring a skip to take away the stone, then self-levelling the concrete to get it ready for the new floor, not to mention the cost of the new floor covering. Milling the stone involves the use of a set of thee milling pads of different grades (50, 100 and 200 grit) which are applied in sequence. You start with the coarse and abrasive 50 grit milling pad and follow this by smoothing this surface with the finer 100 and 200 diamond grit milling pads. Water is used to lubricate and capture the dust which is created during the process resulting in a slurry which needs to be rinsed away and extracted with a wet vacuum between each pad. The process requires the use of a solid weighted rotary machine and a fair bit of muscle power to guide it. 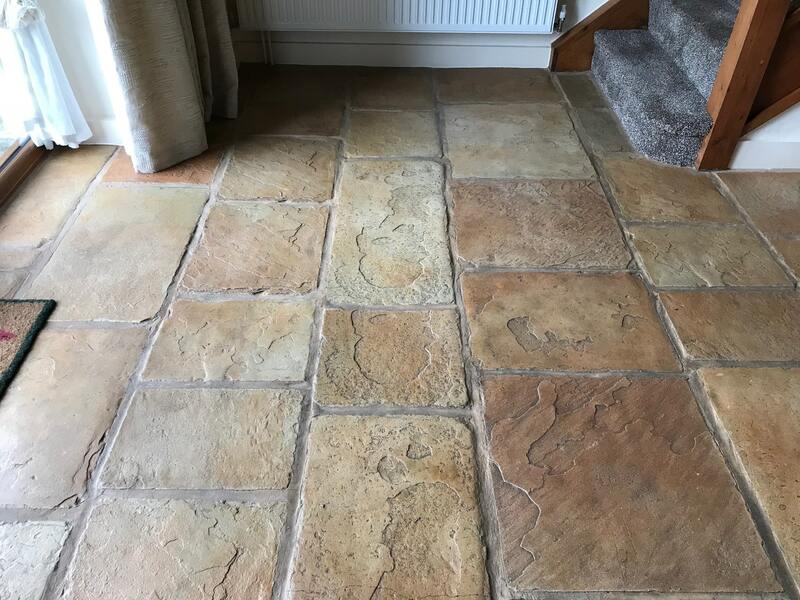 As you can see from the pictures the difference is immense but what you can’t tell from these photos is how smooth the stone feels to the touch as its the rough texture of Sandstone that catches all the dirt and makes it hard to clean, even after it has been cleaned and sealed professionally. 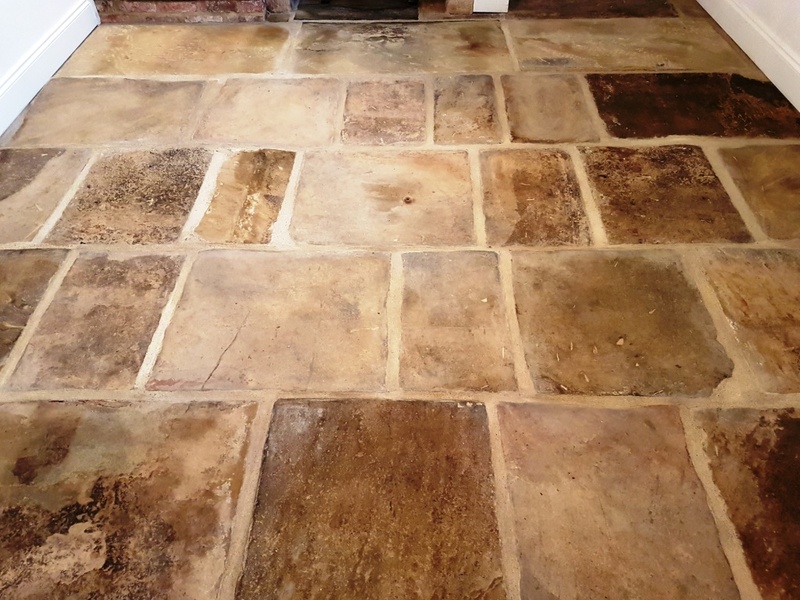 To refine the surface of the Sandstone even further the Milling process is followed by the application of finer grade Burnishing pads, again applied with water and the soil rinsed off between each pad. This process uses no chemical cleaning products only water, Diamond pads and machinery. 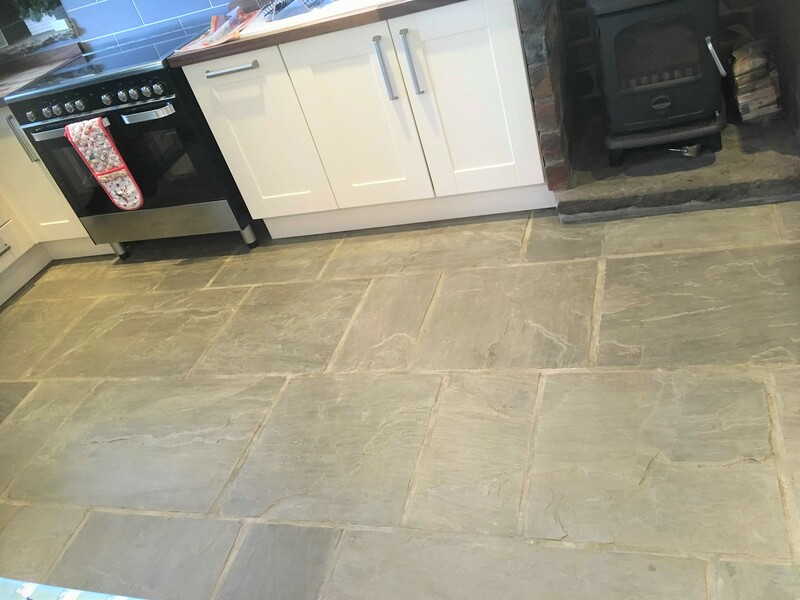 After allowing the stone to fully dry out overnight we finished the job with several coats of Tile Doctor Colour Grow which is a colour enhancing impregnating sealer that protects the stone from within. It gave the stone a nice low-key matt colour enhanced finish that really showed off the character in the stone. 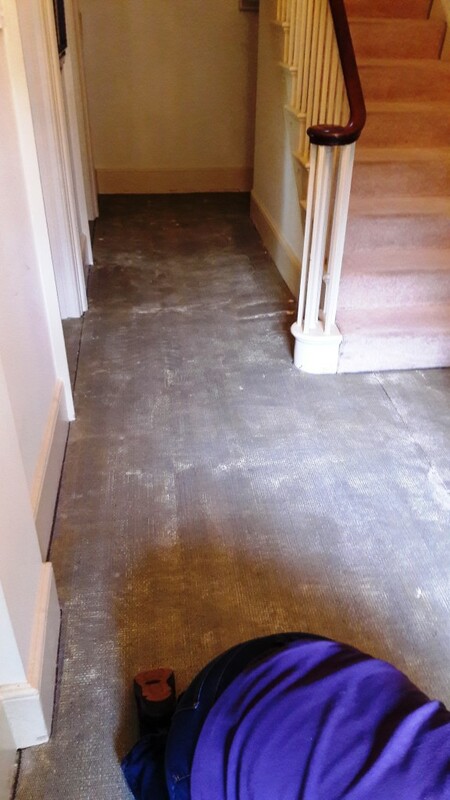 The client was over the moon with the result and were so pleased they had not ripped up the floor! We were called by our client to visit a property in Garstang, a small market town in Lancashire which is halfway between Preston and Lancaster. 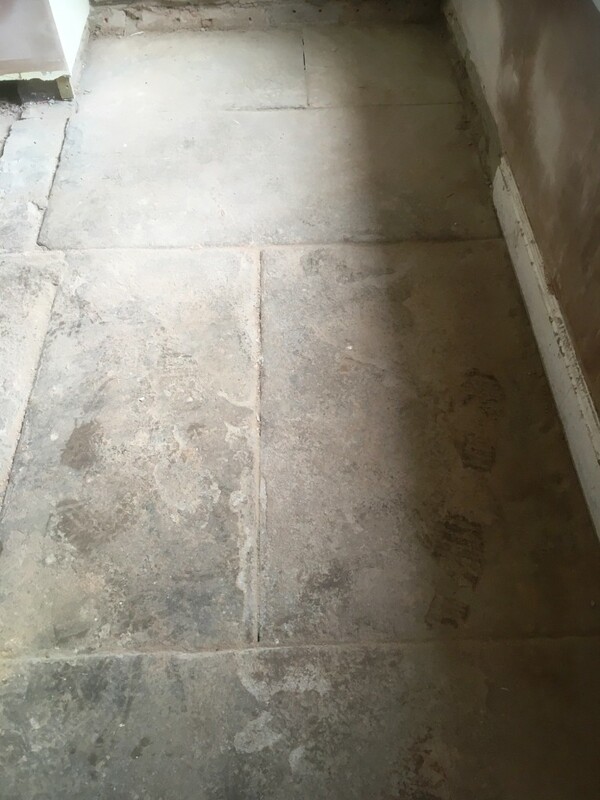 Where possible we like to survey the floor before doing any work, so we can ascertain what may have happened to the floor, what the best course of treatment is and of course provide the customer with a quote. 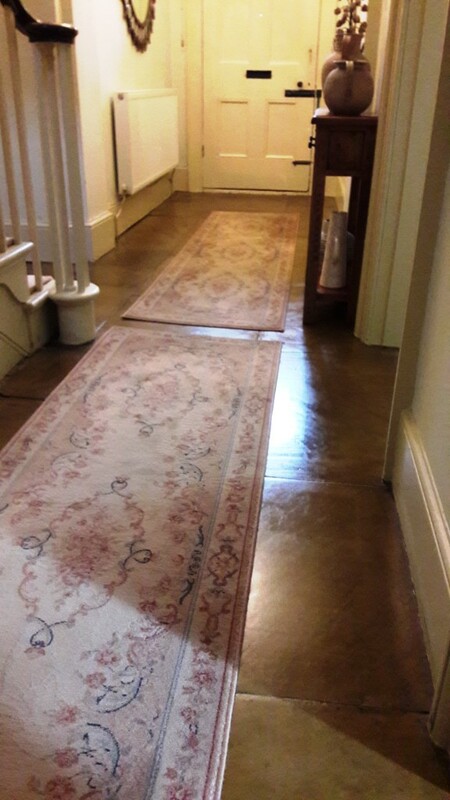 The large hallway floor was certainly in need of some love and care as it was not looking its’ best. 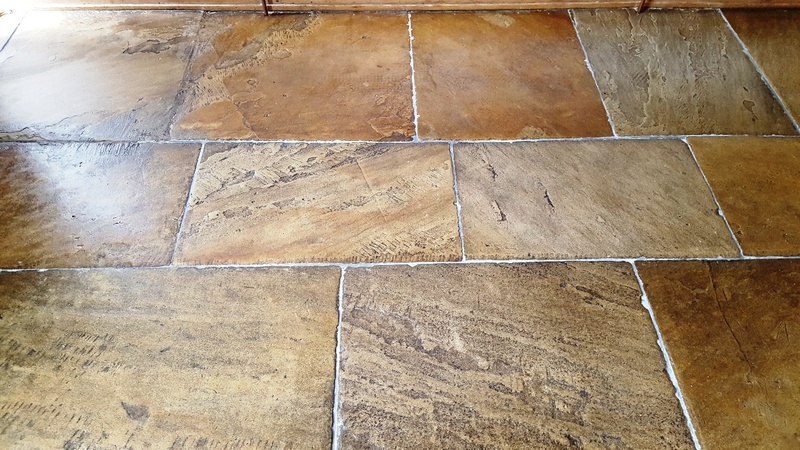 On initial inspection it appeared to be tiled in Sandstone slabs, but it is in fact a Sandstone effect concrete floor. 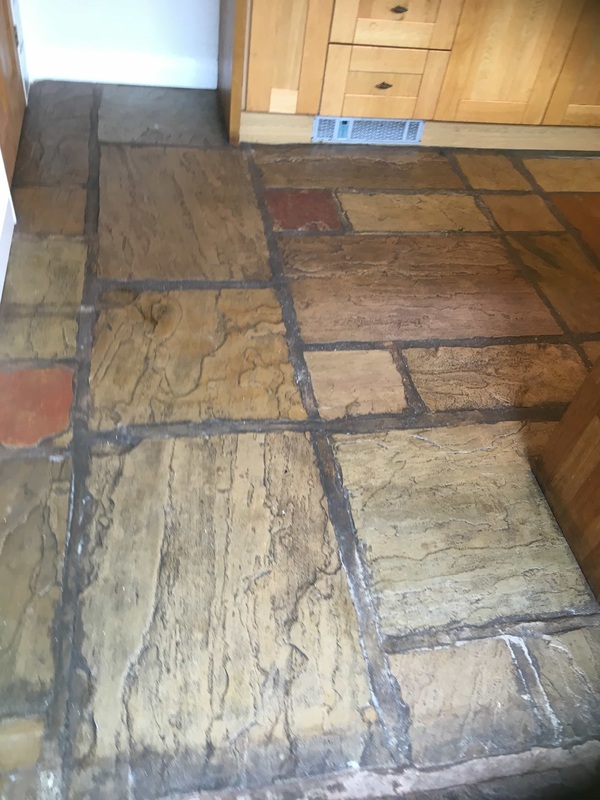 The owner had been using washing-up liquid to clean the floor which over time had upset the colours that were dyed into the cement. The pores in the concrete were also ingrained with dirt. We discussed with the client the cleaning process and showed them a test patch. They were happy with the test area and the price for the work, so we booked a mutually convenient time in to carry out the cleaning. 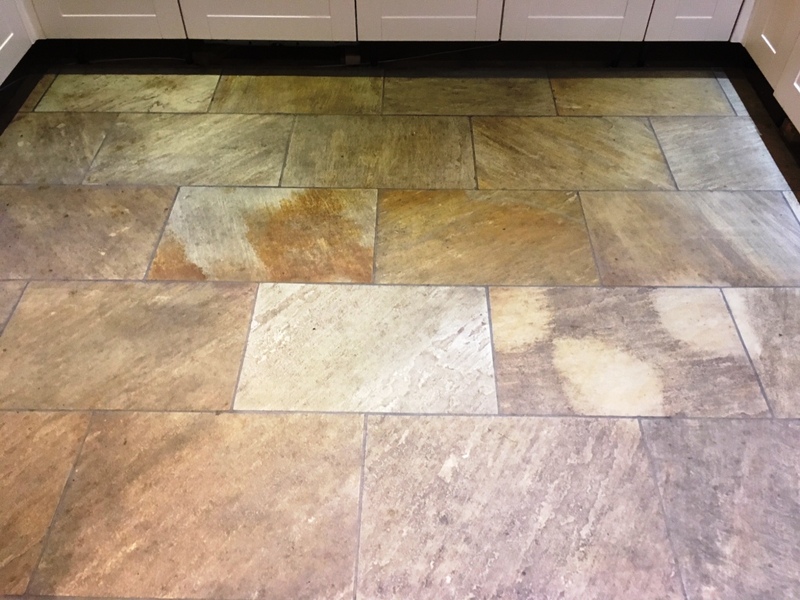 To deep clean the floor, we applied a strong alkaline cleaning product called Tile Doctor Pro-Clean. Not only does this product break down the dirt it can also strip off coatings such as old sealers when used in a more concentrated form. We left the product to dwell for a short while and then using a rotary buffing machine fitted with a Black Buffing pad we gave the floor a good scrub. Using the wet vacuum to remove the soil residue generated by the clean. We repeated the process to ensure the floor was deeply cleaned and any sealer residue removed. The floor was then left overnight to dry out, with a little help from the radiators as the weather had turned a little cooler. We returned the following day and checked the floor was fully dried out using our moisture meter. 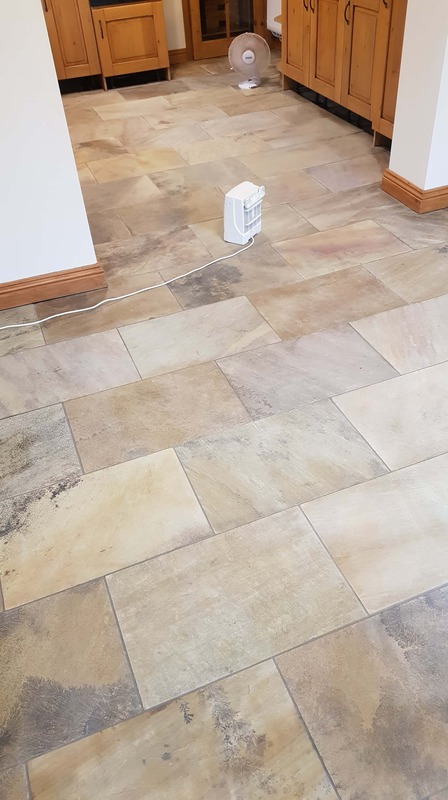 We then applied four coats of Tile Doctor Seal and Go, this provides both a stain resistant surface seal and a durable low-sheen appearance. The concrete tiles now looked great but unfortunately the colour of the grout lines had been affected by the washing-up liquid and needed more work. 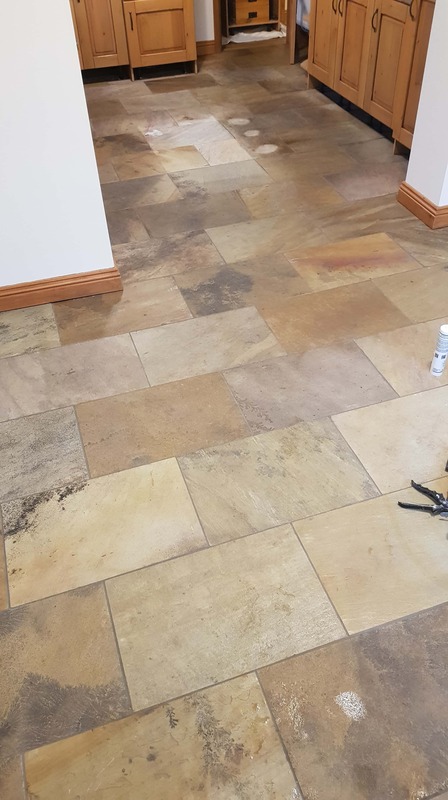 We decided the best course of action was to apply a Sandstone Grout Colourant, so we arranged to call back the next day once the sealer had fully dried and applied the colourant. 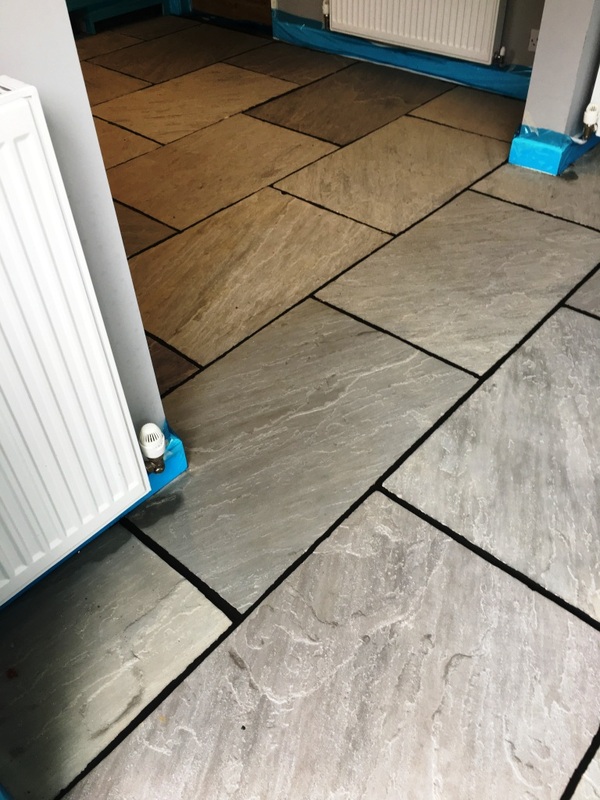 We use the Tile Doctor range of Grout Colourants which are available in ten popular colours, the colorant also provides a barrier over the surface adding further protection. The customer had left us the keys to the property so needless to say, they were very happy with the transformation when they returned. 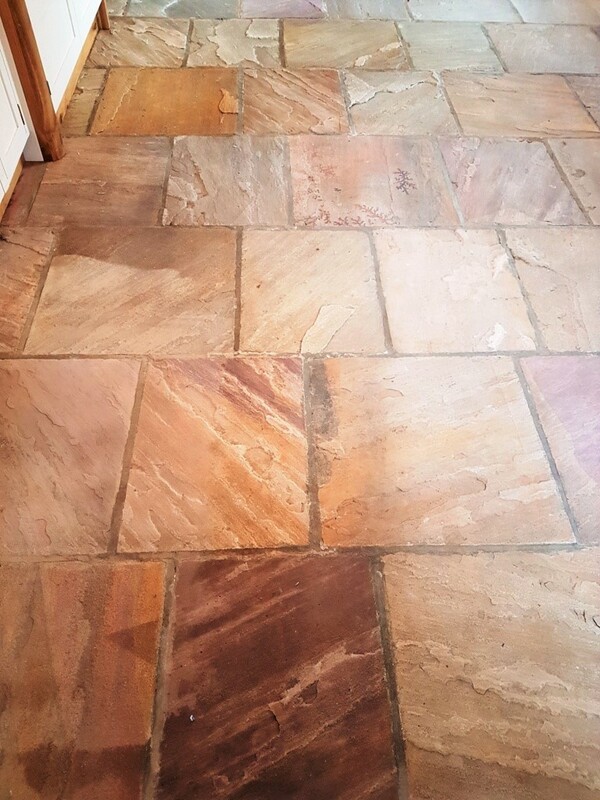 I think you’ll agree the floor looks great and they can keep it looking in great shape by using Tile Doctor Neutral Tile Cleaner which is designed for cleaning sealed floors. 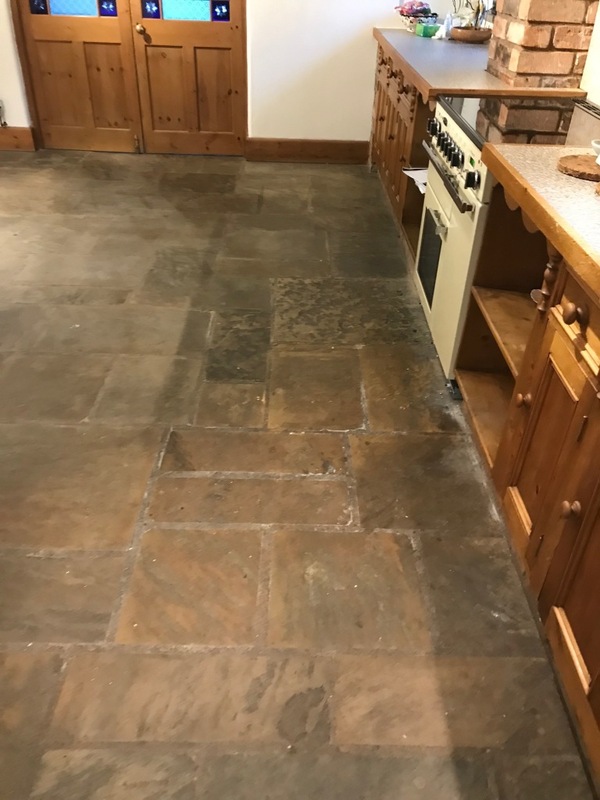 This customer had just moved into a lovely property in the small Lancashire town of Burscough and wanted to have the Sandstone Kitchen floor professionally renovated as it was not looking its best. I arranged an appointment to visit the property after discussing the floor over the phone, some customers like to get a quote over the phone and although I’m happy to give someone a ball park figure I really need to see the floor in order to give them an accurate price as you simply don’t know what your going to find. 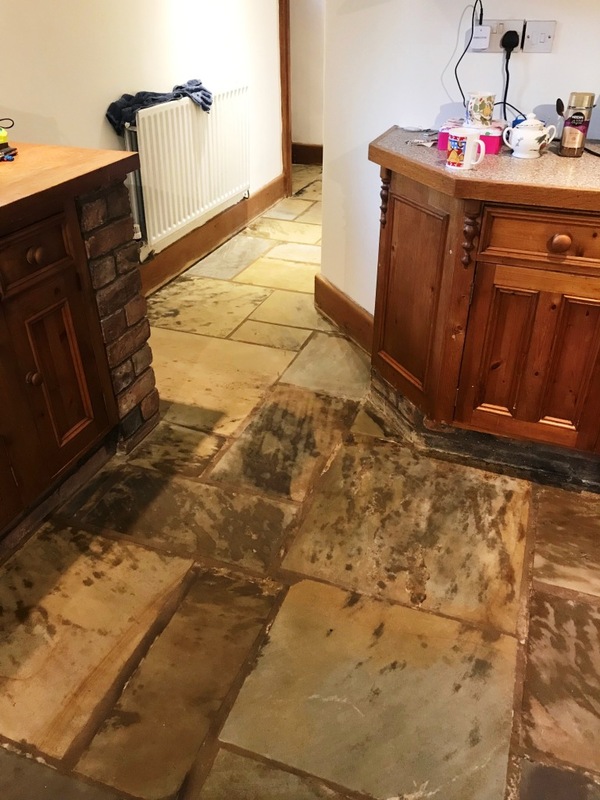 Upon inspecting the floor inspect the floor I could see the previous owner had sealed the floor with multiple layers of Varnish which is not a suitable agent for protecting Sandstone floors. 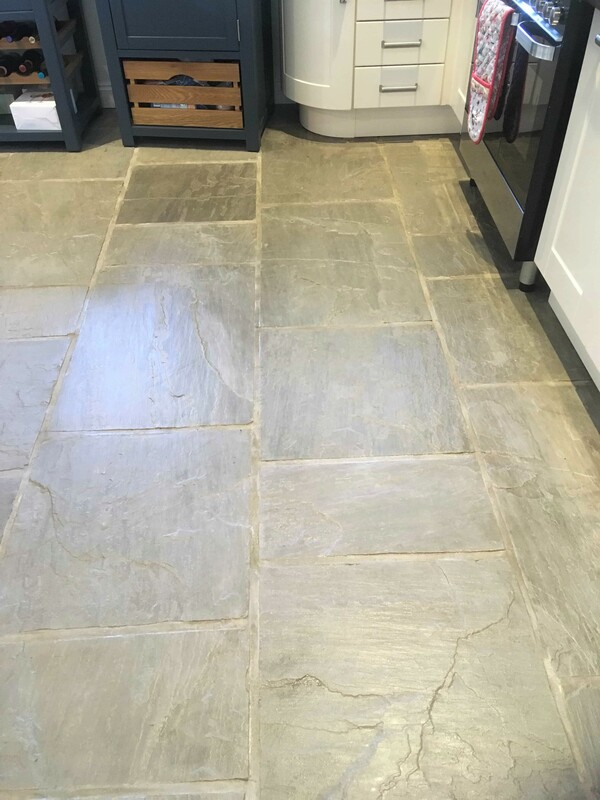 The stone was the riven variety and was trapping dirt across its veins and was now proving difficult to clean, the grout had also gone black with dirt. Undeterred I did a test clean on part of the floor and the results proved promising, so we agreed a price and date to return and complete the job. 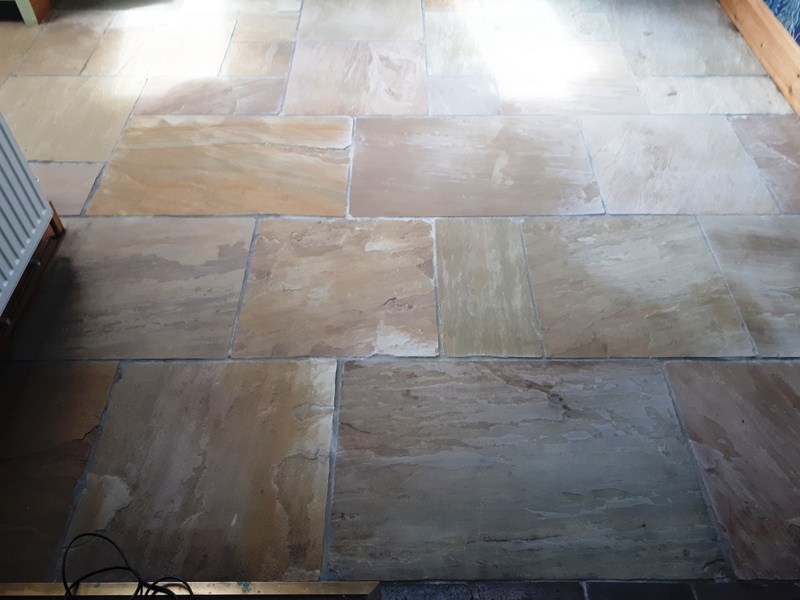 To deep clean the floor the sandstone flagstones were covered in a strong 1:3 dilution of Tile Doctor NanoTech HBU Remover which stands for Heavy Build-Up Remover. It was left to dwell and soak into the stone for ten minutes before being scrubbed clean using a rotary buffing machine fitted with a black scrubbing pad. The now dirty cleaning solution was then removed using a wet vacuum and then the whole floor rinsed with water. I had to repeat the process on stubborn stains assisted with a steam cleaner to lift the dirt out of the pores of the stone. Once I was happy with the floor I gave it a final rinse to with water to neutralise the floor and remove any trace of cleaning products. It was then dried as much as possible with a wet vacuum and then left to dry off fully overnight. 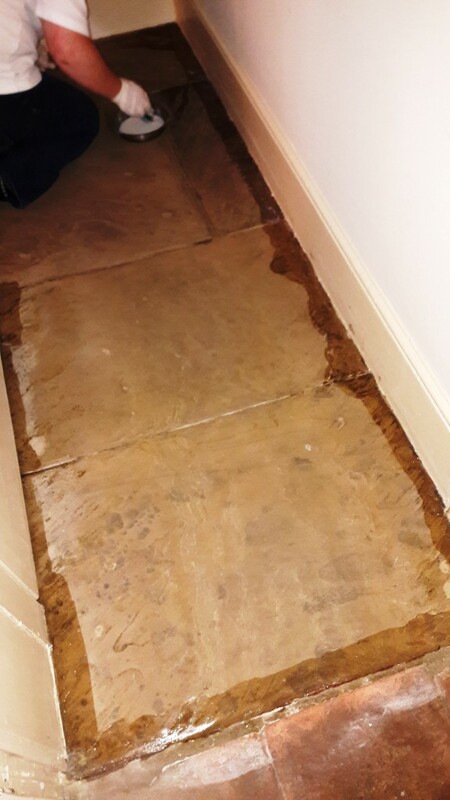 I returned the next day to seal the floor first checking it for dampness using a damp meter, the flagstones were dry, so I was able to proceed as planned. 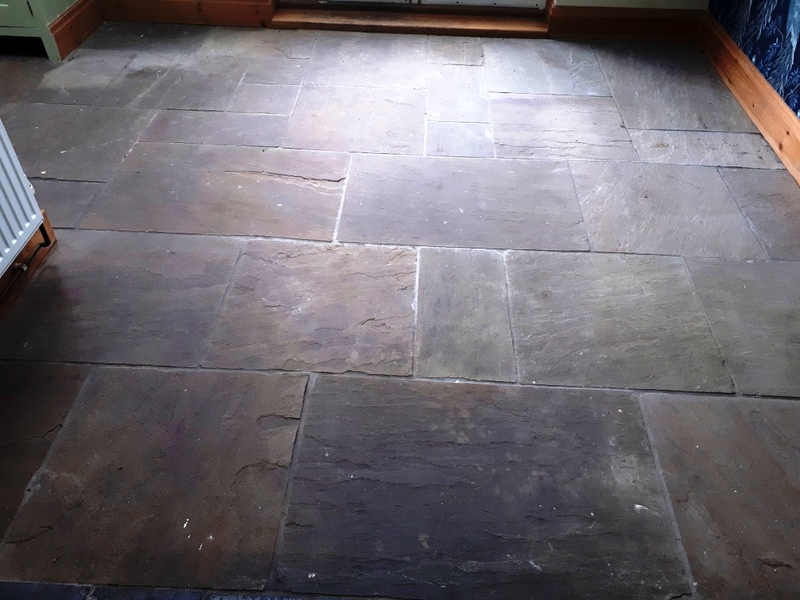 To seal the stone, I used multiple coats of Tile Doctor Seal & Go Extra which is a breathable acrylic sealer that can be used on internal and external Sandstone flagstone floors and does a nice job of lifting the appearance of the stone. 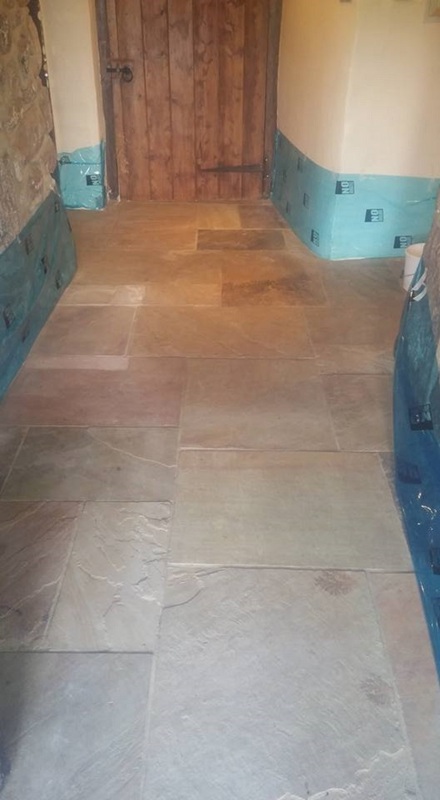 You can see from the final photograph that the Sandstone flagstones and grout now looks so much better. 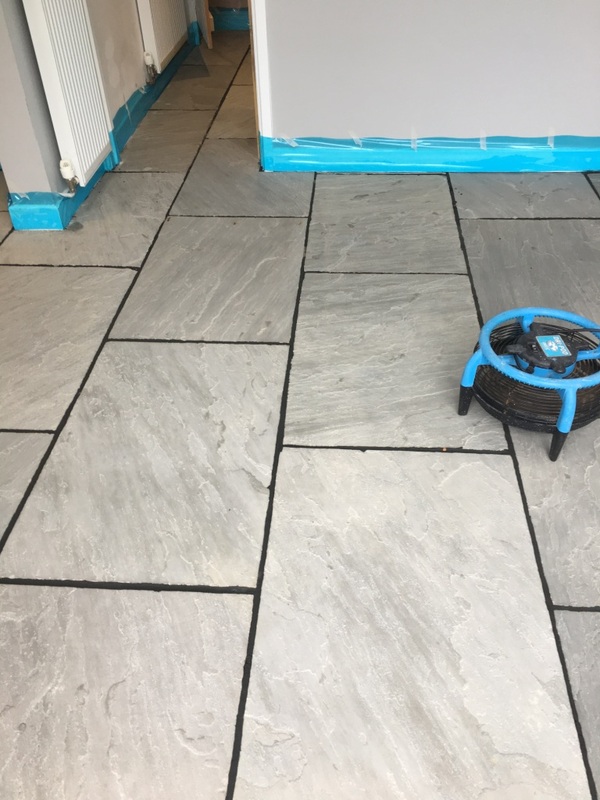 My Customer was amazed with the transformation and the floor now looks brand new, they even left the following comment on the Tile Doctor feedback system. When I was asked to visit this job, I understood that the property was Grade One Listed and I was in for a treat when I arrived. 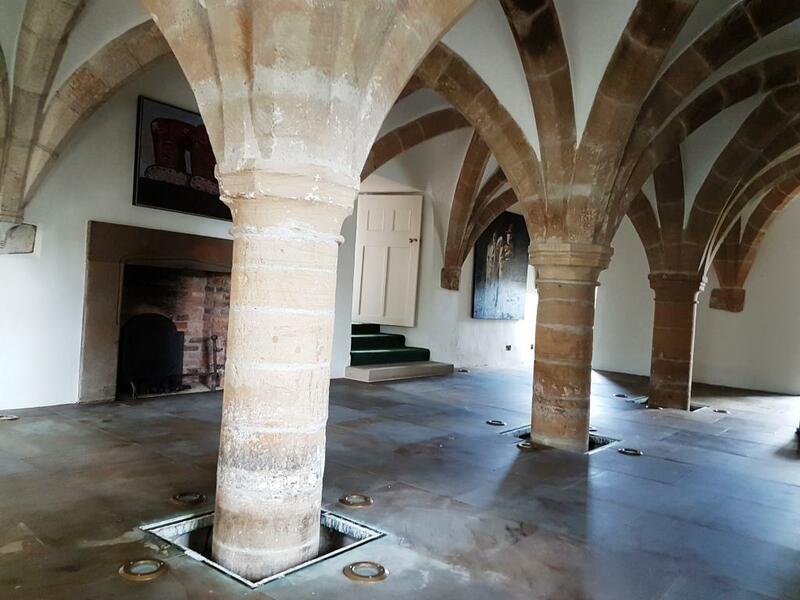 The property is an undercroft which is traditionally a cellar or storage room, often brick-lined and vaulted and used for storage in buildings since medieval times. In modern usage, an undercroft is generally a ground (street-level) area which is relatively open to the sides but covered by the building above. This example was part of a large 12th Century building near Bedale which is halfway between Harrogate and Middlesbrough, that had been converted into luxury apartments. It was truly impressive, by far one of my favourite jobs to date. The magnificent building had been tastefully restored and renovated some years ago. You will see from the photos how unique it is, although it is hard to do it justice in photos. 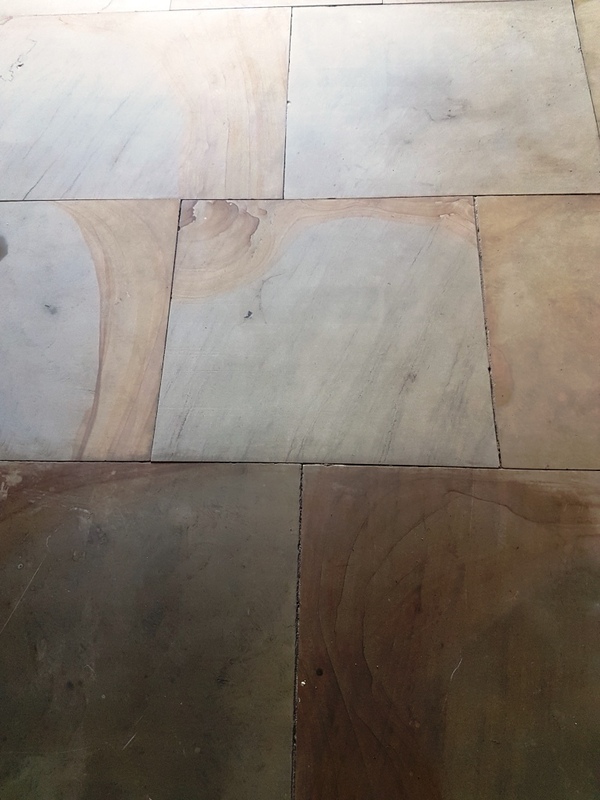 Since that time the huge 60sqm Sandstone flagstones had become dirty and now needed to be deep cleaned and restored to its’ former self. I discussed what was required with the owner and went through the cleaning procedure I felt would be most appropriate. This was well received, and we agreed my quote and arranged a suitable time to return and complete the work. I must say I felt honoured and privileged to be asked to work on the floor as this is not something you would trust many people with. 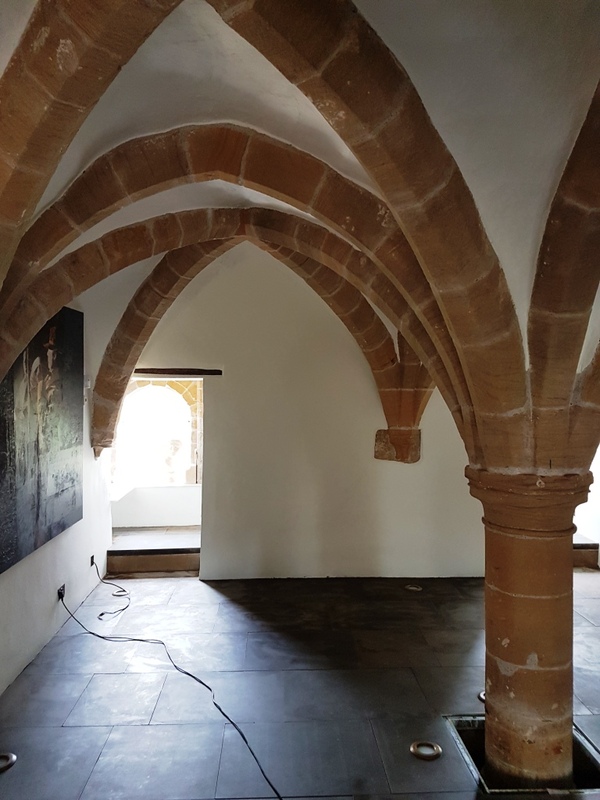 I returned on the agreed date to start the cleaning and I was a bit apprehensive at first, as naturally with such an old building I wanted to be confident that the methods I was going to use would work without issue. Also, there was some very, very expensive Marble statues scattered about near the edge of the floor which I was very mindful of. 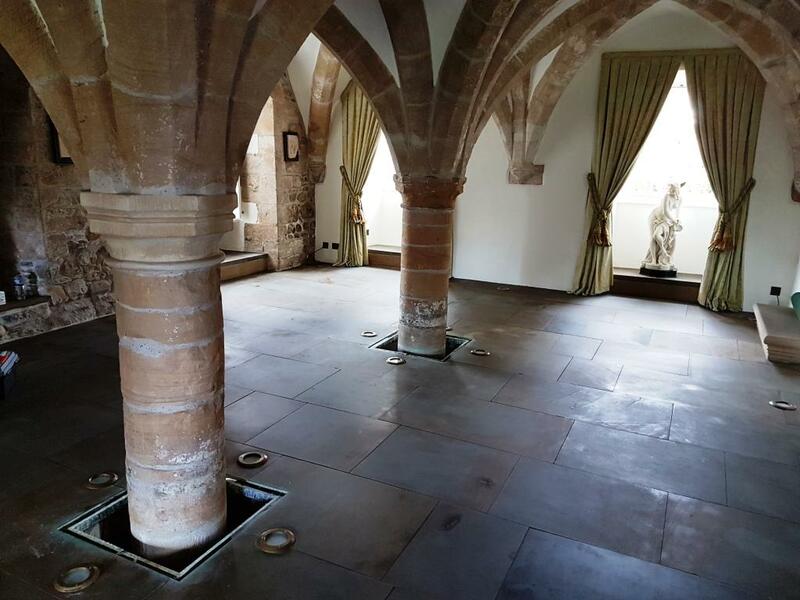 It was clear that the utmost care was required to restore this beautiful floor. In the end I did not need to worry as it was quite straightforward. 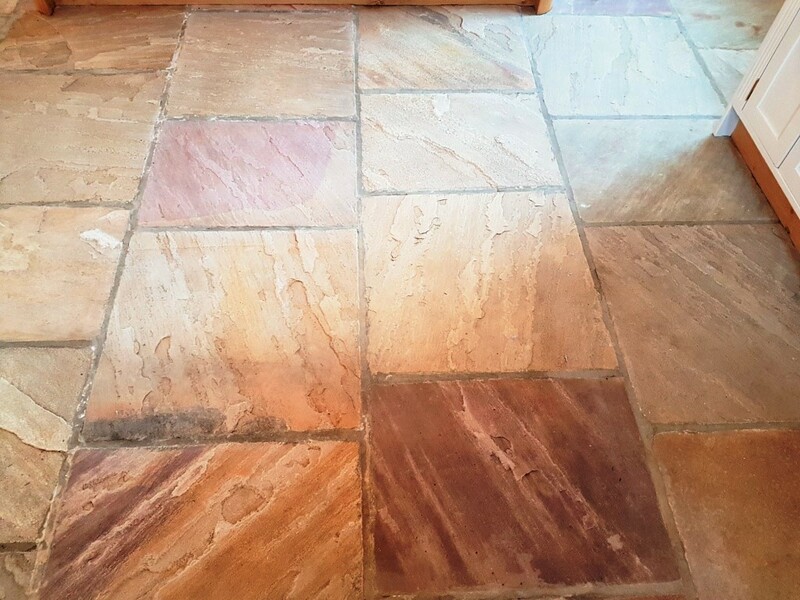 The floor was nice and flat and graded sandstone, in pretty good physical condition. I cleaned the floor by applying a strong dilution Tile Doctor Pro-Clean to remove old sealers and break down the dirt. I left this on the floor for ten minutes before scrubbing it in with what turned out to be several black scrubbing pads to get the dirt out of the stone. 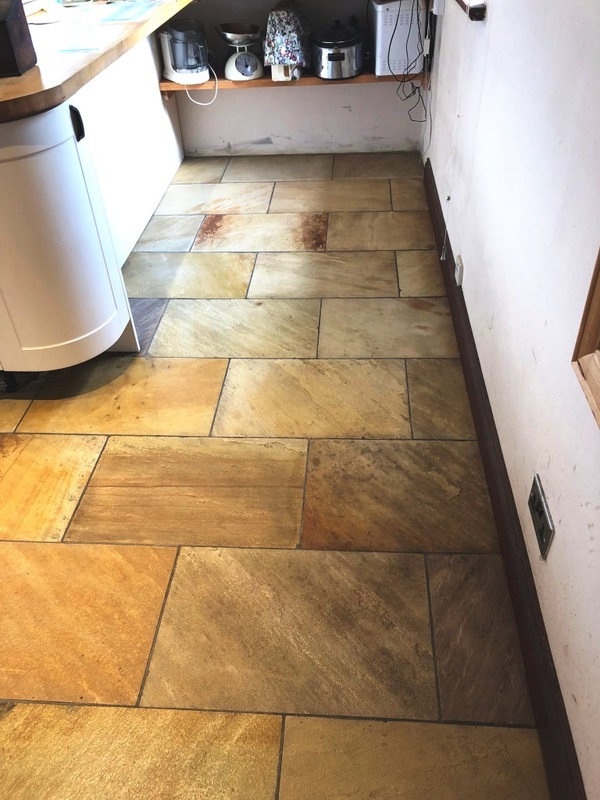 Pro-Clean is a highly effective Tile and Grout cleaner which can deal with all sorts of issues including grease, grime and general dirt build up. 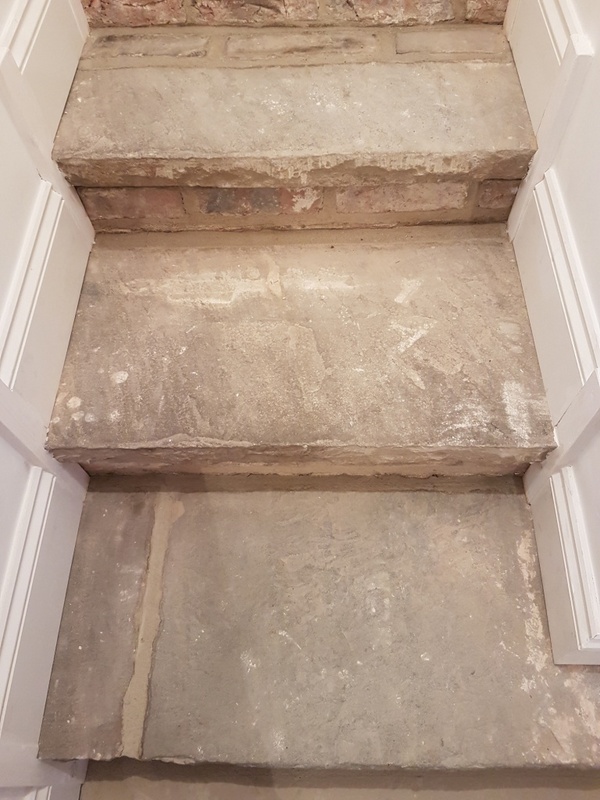 I worked in sections and found some of the flagstones quite challenging to clean due to their sharp edges which tore into the pads and destroyed a few during the process. Luckily, I had bought plenty of replacements along and with a bit of perseverance, I was able to give the floor a very thorough clean. The floor was then rinsed with water and the soil extracted using a wet vacuum. After cleaning and rinsing the whole floor I left it for a few days, so it could dry out thoroughly before I returned to seal it. When I returned I checked that the floor was completely dry by taking some moisture readings. All was well, but I noticed that the room became dusty very quickly from all the exposed stone, so l vacuumed the floor first. I chose to use Tile Doctor Ultra Seal for this floor, main reasons being it’s an impregnating sealer that works by occupying the pores in the stone thus preventing dirt from becoming ingrained there also, it leaves a natural look finish that doesn’t darken the stone which was ideal for use in the Undercroft where there isn’t much natural light. I applied a couple of coats to the floor and it was soon looking good. It was a massive transformation and the clean floor really lightened up the whole room. The client was very pleased with the result. I think you will agree this is a very special room! 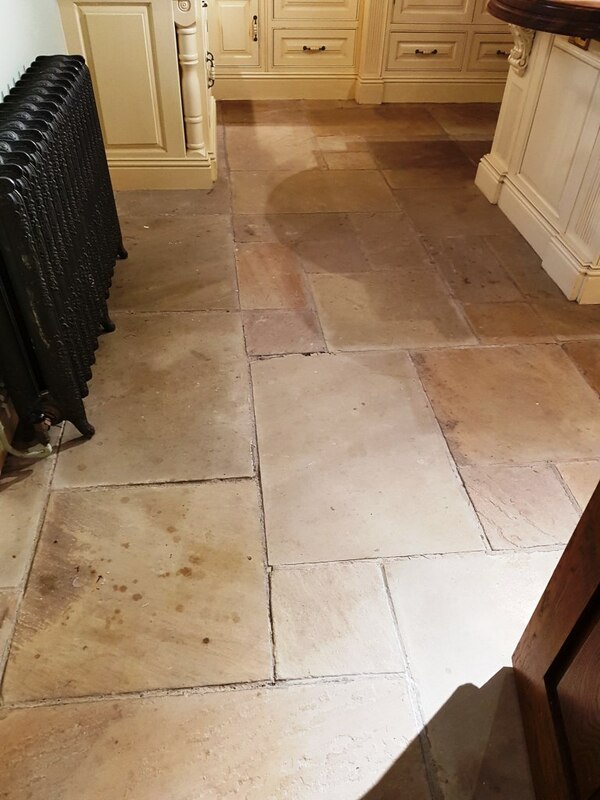 This was a typical and relatively straightforward job for me, but I thoroughly enjoyed it because it amply demonstrates how a modest investment in professional cleaning and sealing can transform a tired old Yorkshire Stone floor into something really stunning! Older properties in the small village of East Morton, near Keighley in West Yorkshire, are built almost entirely of locally quarried Sandstone – from its Manor Houses, Churches and barns to the many cottages built during the Industrial Revolution for workers in Morton’s textile and paper mills. Yorkshire stone is a sedimentary rock made up of quartz, mica, feldspar, clay and iron oxides. Its colour depends on the ratio of minerals it contains, and differs throughout the quarries where it is mined. It is incredibly hard wearing and durable, and has been used for building, construction and landscaping since mediaeval times. 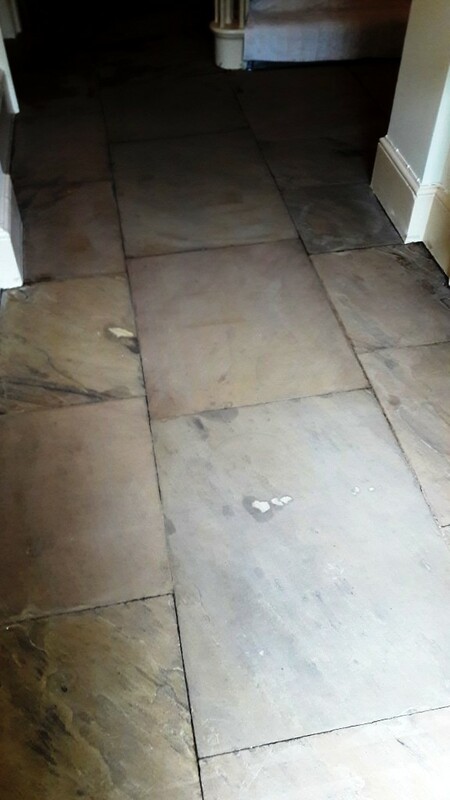 The lovely original Yorkshire Stone floor in this client’s home was in great condition but looked lifeless and uninteresting. As the local Tile Doctor agent, I was tasked with deep cleaning and sealing the floor to bring it back to life. Rather unusually, this customer wanted a matt finish for the floor – which on reflect was a great choice. I started by deep cleaning the floor with Tile Doctor Pro-Clean. This is a concentrated, multi-purpose high-alkaline cleaner, stripper and degreaser which is safe to use on all types of tile, stone and grout including natural stone. 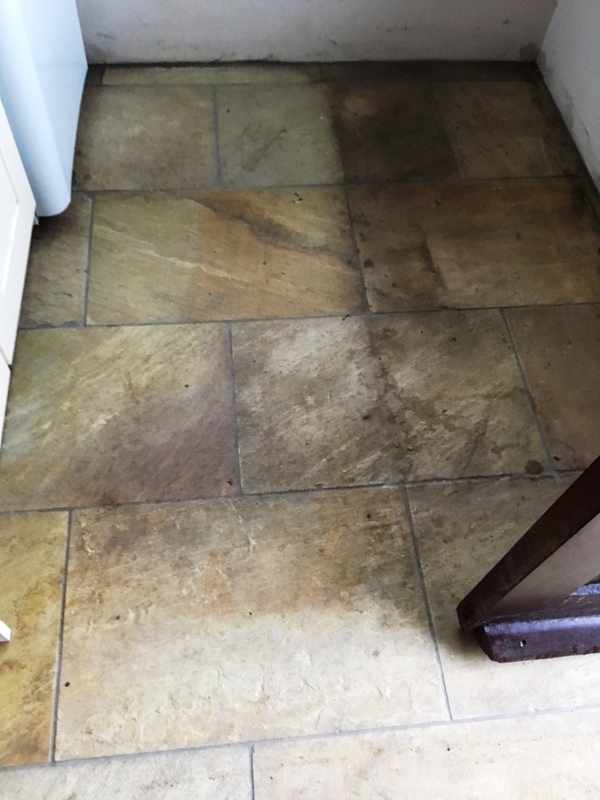 I diluted one part Pro-Clean to three parts water – enough to ensure that any traces of grease, scum, oil, mildew and algae were removed and scrubbed it in using a floor buffing machine fitted with a black scrubbing pad and running at slow speed to cut down on splashing. This brought out all the dirt from the floor which I then rinsed off with more water and extracted with a wet vacuum. Stubborn areas were re-treated using the same process and once I was satisfied the floor was clean I left the floor for two days, so it could dry out thoroughly. 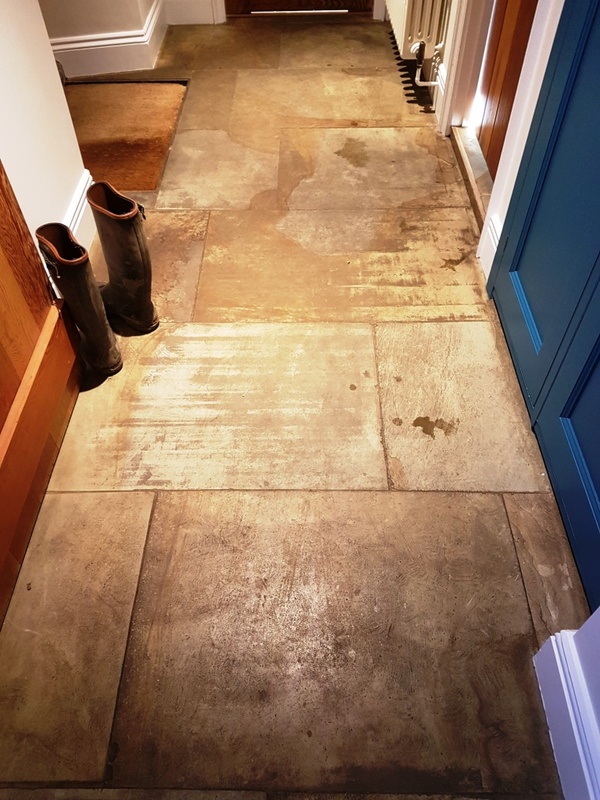 The next step was to test a couple of suitable Tile Doctor sealers to see which would give the best matt finish the customer was looking for. 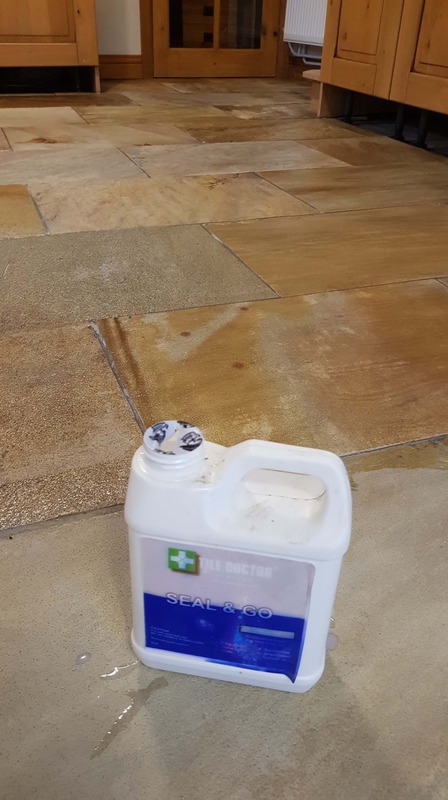 I decided upon Tile Doctor Ultra Seal which is a premium, solvent-based penetrating sealer formulated to provide maximum stain protection yet without changing the colour of the stone. 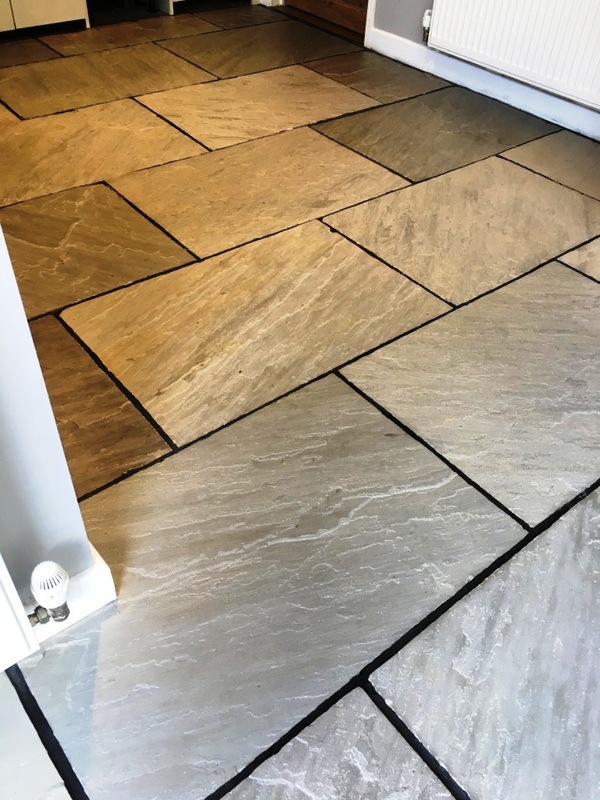 Being a premium product it’s ideal for high traffic areas such as hallways, kitchens and stairs, it’s also an excellent grout sealer and a perfect choice for this floor. Most importantly, it gave the no-sheen, natural-look finish that the customer wanted. I started by sweeping and vacuuming the floor to ensure that every trace of dust was removed before sealing. Then I applied two coats of Tile Doctor Ultra Sealer – one in the morning and one in the afternoon to allow the first coat to dry out before applying the second. 30 minutes after applying the second coat I tested with water droplets to make sure that the surface was completely sealed. The customer was able to walk on and use the floor as normal after just two hours, and after just 24 hours the full cure was achieved. What a transformation! 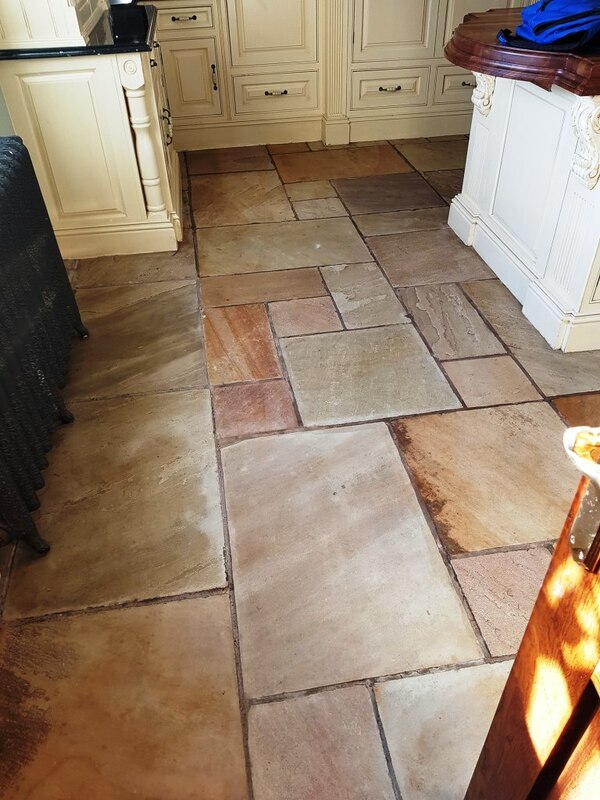 The lifeless, grey floor was now full of colour and character, highlighting all the wonderful and original textures and tones in the Yorkshire Stone. The customer was very happy! 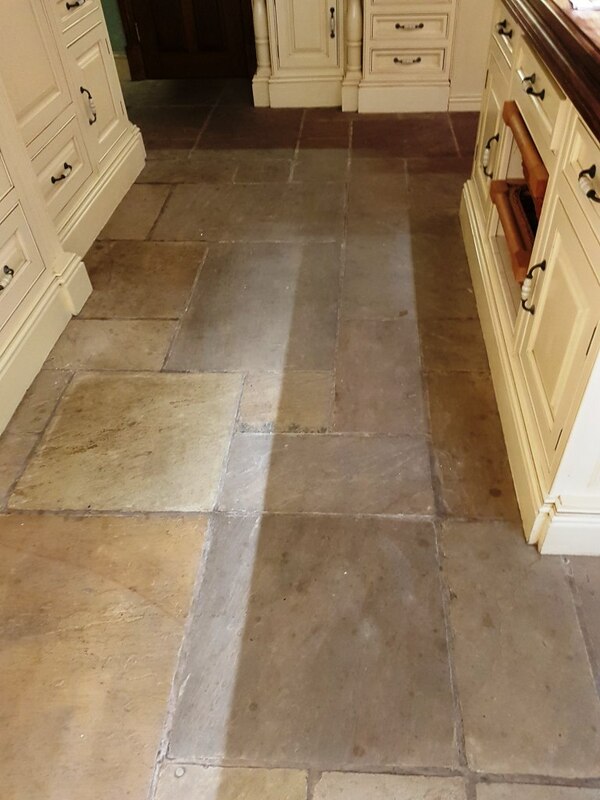 This customer who lived in the old North Yorkshire market town of Bedale, had a Lapicida Sandstone floor installed many years prior and over the years the sealer had worn off and dirt had become ingrained into the pores of the stone making it dull and difficult to clean effectively. 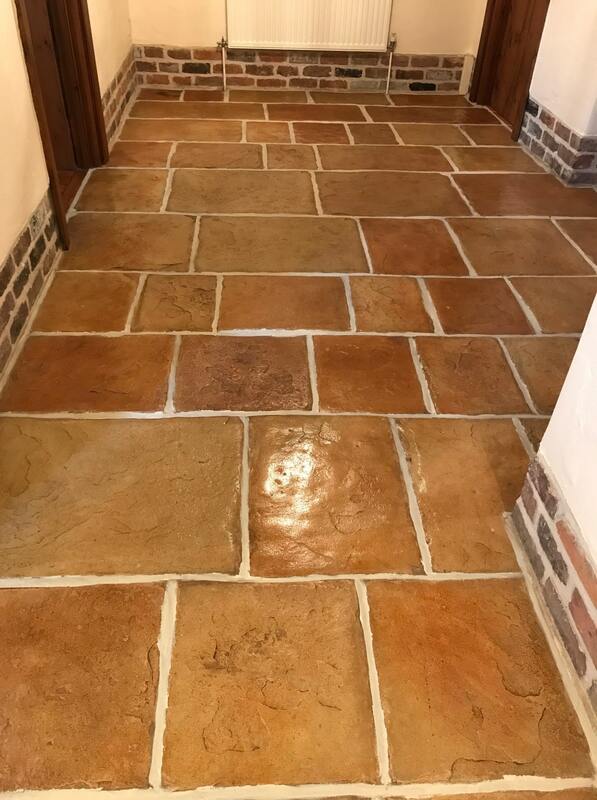 Based in Harrogate, where they have Europe’s largest stone gallery, Lapicida are a premier Tile and Stone company that specialise in reclaimed Sandstone with prices that range from £79 to £594 per square metre. 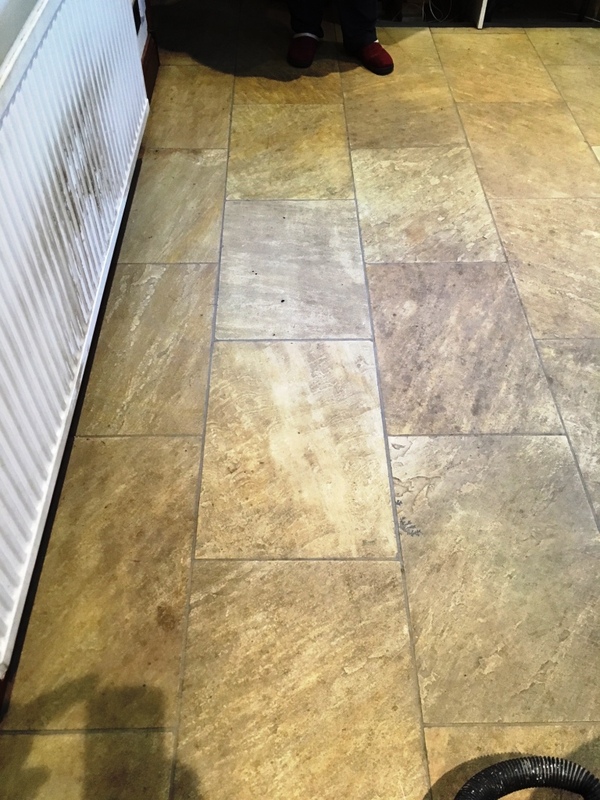 Naturally having such an expensive stone floor installed my customer wanted it to look its best however when your living with a stone floor day in, day out you fail to notice the gradual decline in its overall appearance. 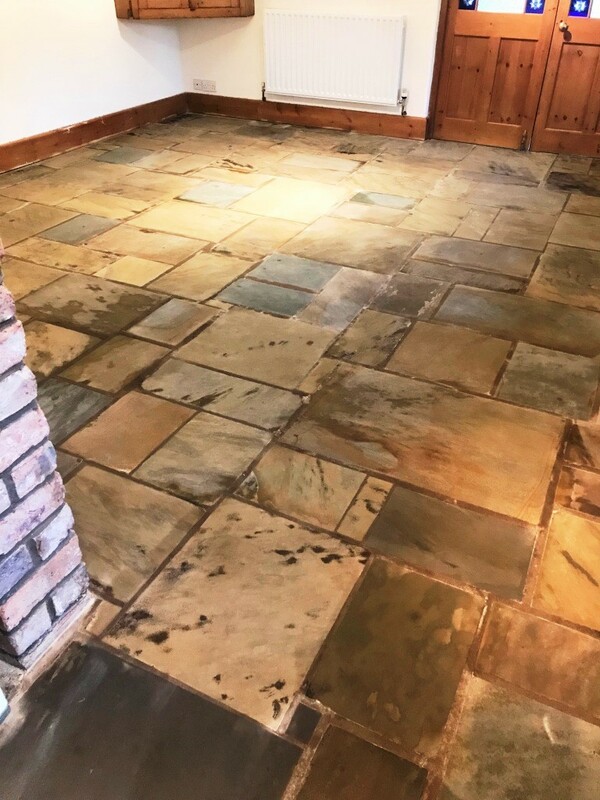 Then one day you suddenly realise the floor is overdue a deep clean and reseal and call in Tile Doctor; there is an alternative however, simply speak to Tile Doctor about setting up an annual Maintenance Plan whereby we pop by once a year to clean the floor and top up the sealer. 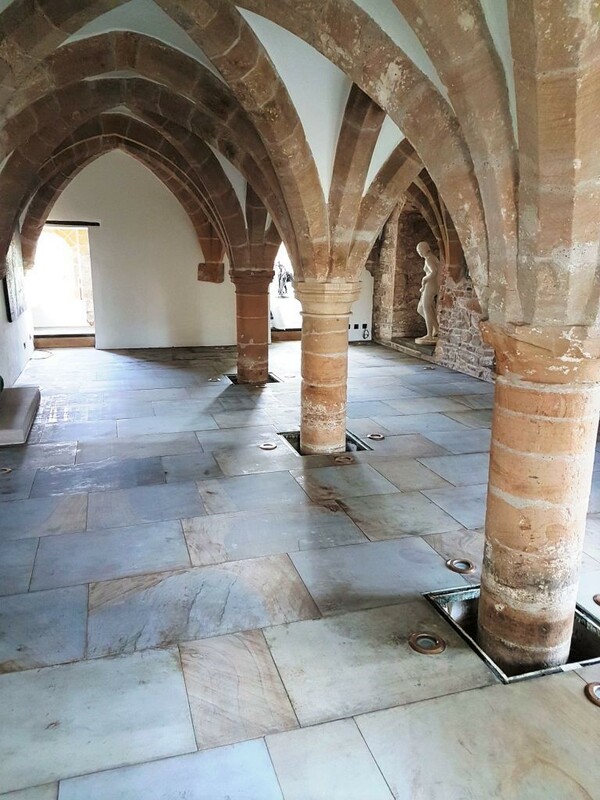 To deep clean the floor the sandstone flagstones were covered in a strong 1:3 dilution of Tile Doctor Pro-Clean which was left to dwell and soak into the stone for ten minutes before being scrubbed clean using a rotary buffing machine fitted with a black pad. 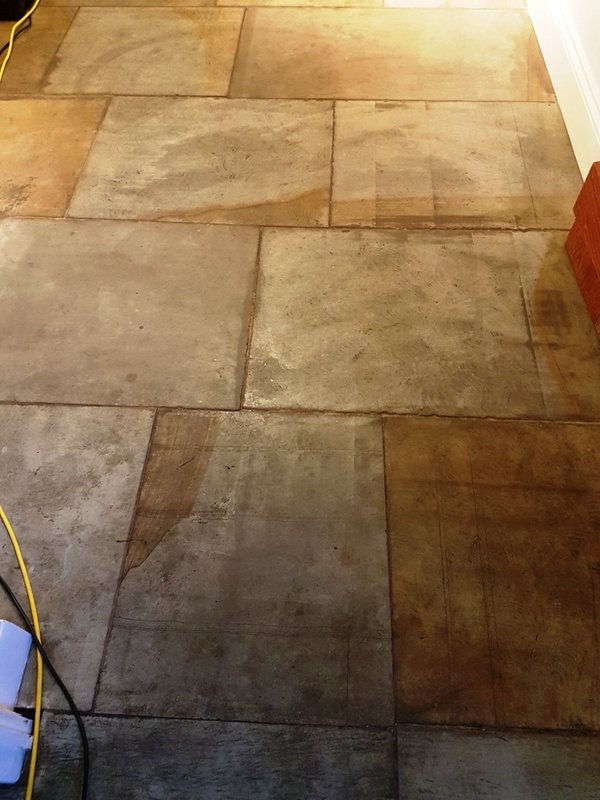 The now dirty cleaning solution was then removed using a wet vacuum and then the whole floor washed down with water and stubborn areas re-treated until I was satisfied. Unusually for Sandstone it was all graded and uniformly flat which made cleaning a lot easier. With the floor clean and all the dirt removed it revealed some black marks, most of which were from candle wax which is very difficult to get off. To tackle this problem a heat gun was used to melt the wax and then it was dappled with a clean cloth. This process was mostly successful, but some still left a faint Mark which the customer was ok with. I returned the next day to seal the floor first checking it for dampness using a damp meter. The flagstones were dry. 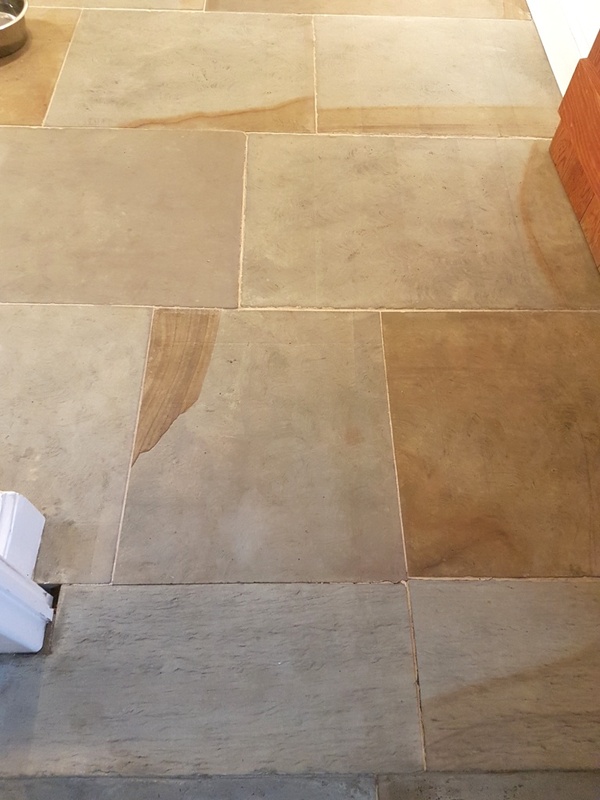 I was going to seal the Stone with Tile Doctor Colour Grow which would have enhanced the natural colours in the stone, but the customer liked the light appearance of the cleaned stone, so l used Tile Doctor Ultra Seal instead; Ultra-seal is a natural look sealer, so it doesn’t darken the stone. 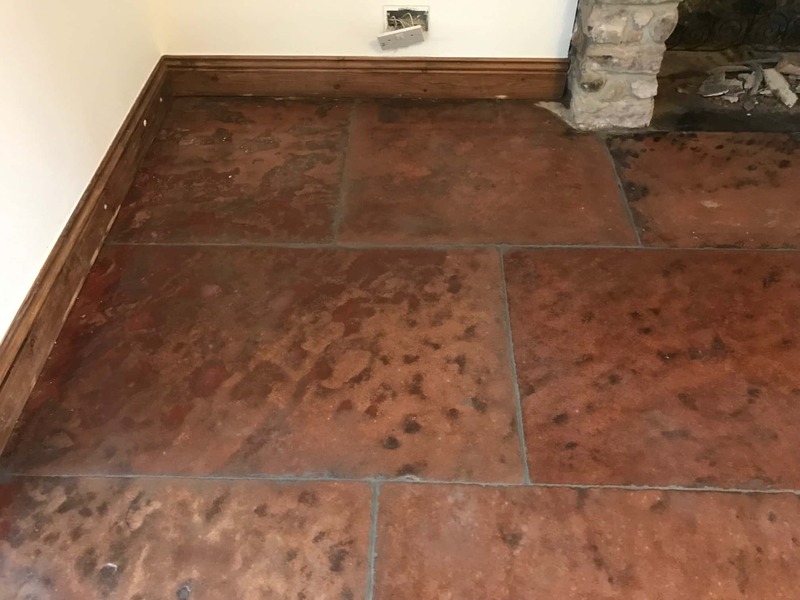 Both sealers are what we call impregnators which work by soaking into the pores of stone protecting it from within by preventing dirt from becoming ingrained. 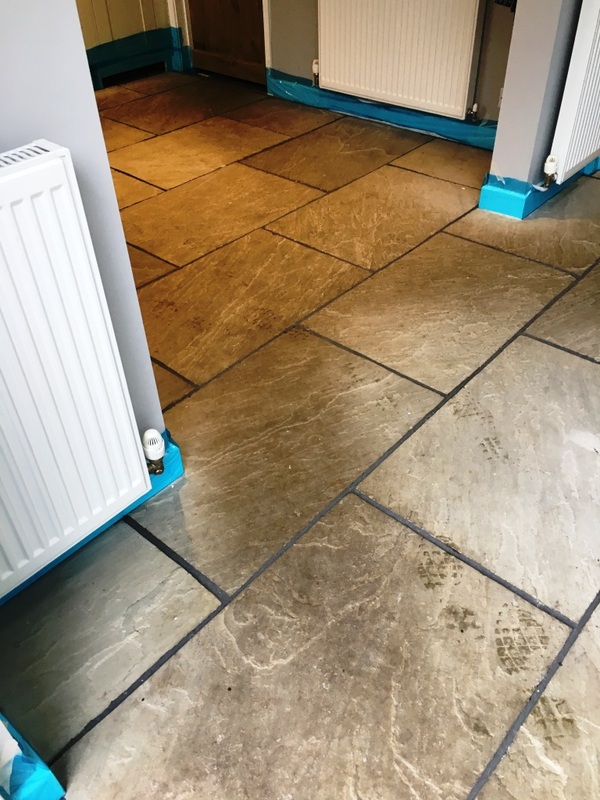 I’m sure you will agree the floor looks much improved, certainly the customer and myself were both very pleased with the transformation of the floor; my customer even left the following testimonial on the Tile Doctor feedback system. This was perhaps the most challenging restoration we have been presented with to date. 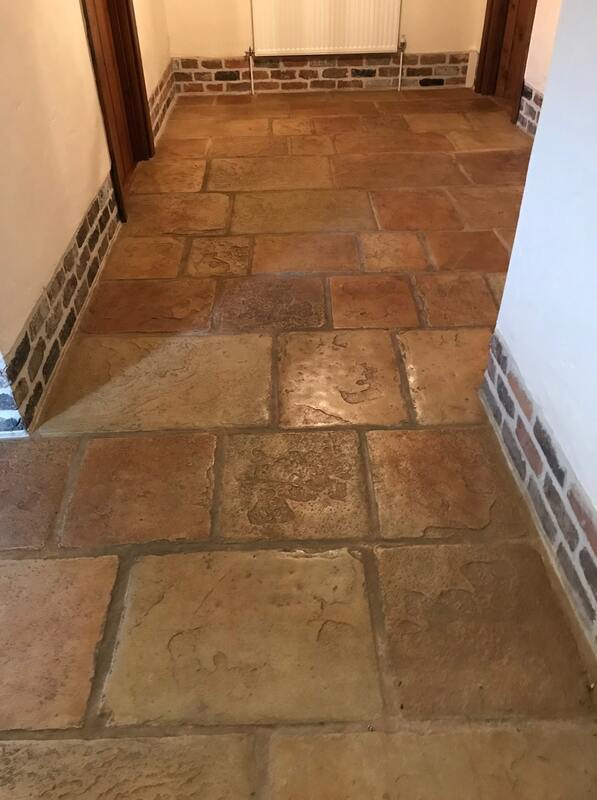 The work involved removing carpet and underlay from a long Yorkstone tiled hallway at a beautiful old Grange in Carbrooke on the outskirts of Watton and restoring the flagstones to their original glory. 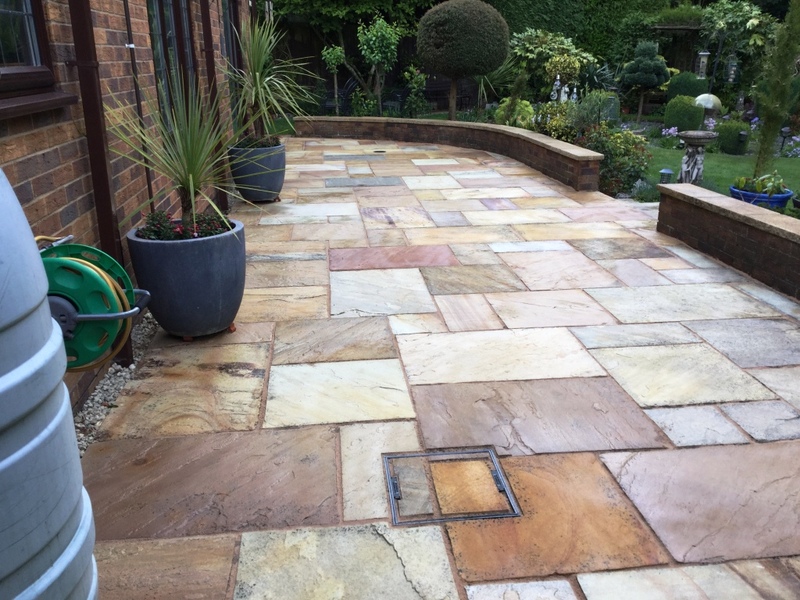 These pavers are a type of Sandstone, a carboniferous sedimentary rock consisting of quartz, mica, feldspar, clay and iron oxides quarried in Yorkshire and having a rich sandy colour with a slightly sparkling surface. 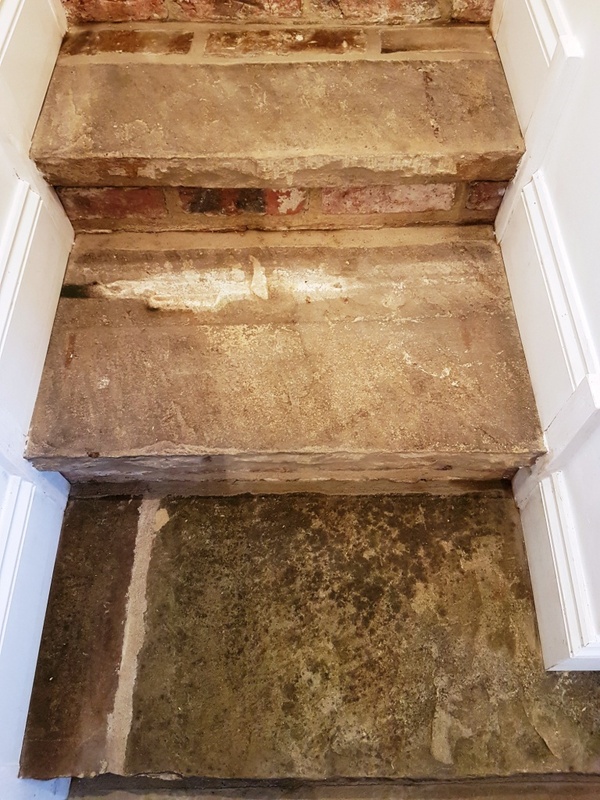 On lifting the carpet, we found, to our dismay, that the rubber-backed underlay had been firmly stuck down to the surface of the stone with what appeared to be a thick layer of yellowing impact adhesive which covered the entire area right up to the thresholds and skirting boards. 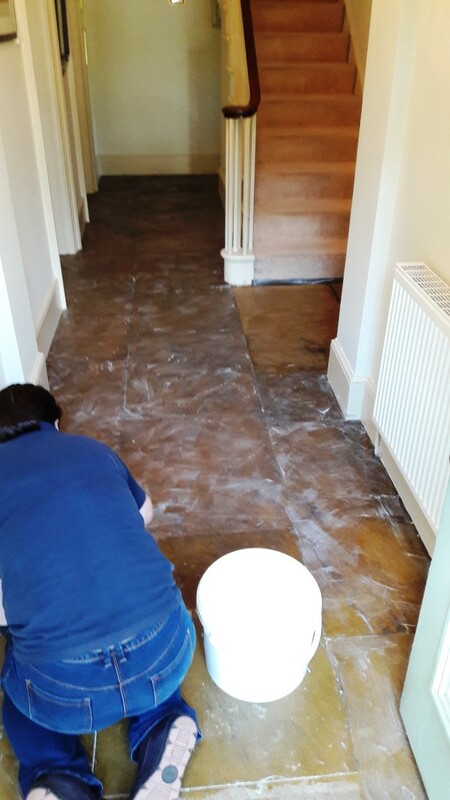 Our first task was to remove as much of the underlay by hand using sharp-bladed scrapers and a heck of a lot of elbow grease. Having done this, the next step was to cover the remaining adhesive layer with a specialist water-based stripper which was applied by brush and allowed to react for an hour. The result was an incredibly sticky substance with the consistency of chewing gum which we had to painstakingly remove inch by inch with paint scrapers. This process had to be repeated twice as even the specialist stripper couldn’t cope with the sheer volume of goo in a single application. The floor was then left overnight to dry out and settle down. 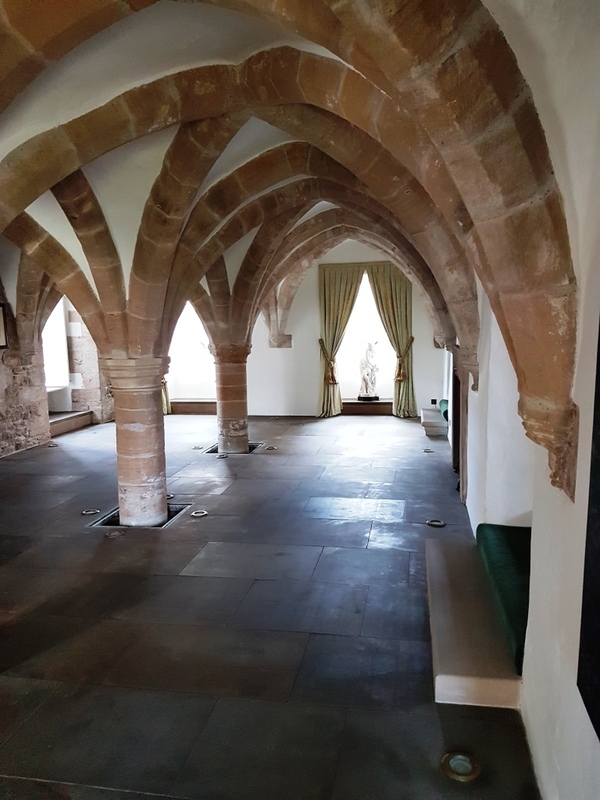 The following day, we deep-cleaned the whole area using very strong mix of Tile Doctor Pro Clean and Remove & Go, scrubbed in with a rotary machine fitted with a black stripping pad. 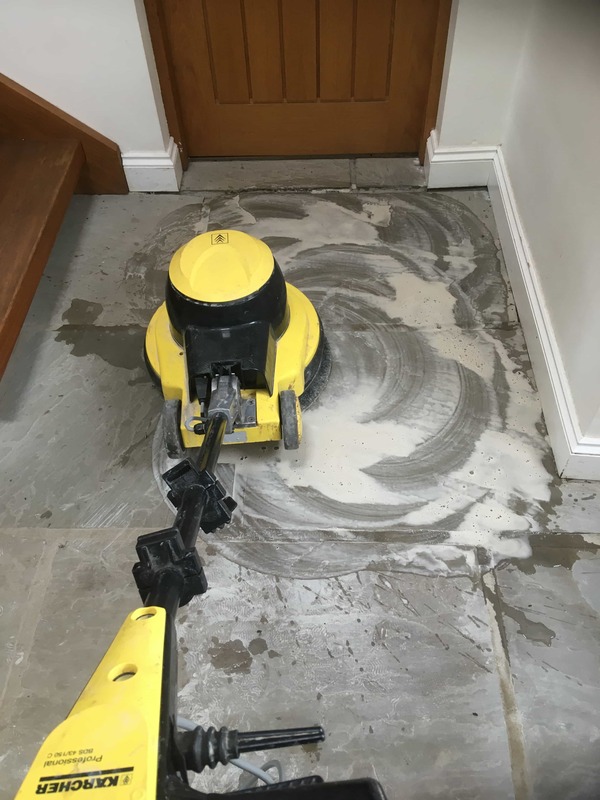 Four pads were used up in this process as they quickly became clogged with the thick slurry which was then power rinsed and vacuumed away from the floor. Any remaining patches of the glue were further softened using Tile Doctor Nanotech HBU Remover and carefully picked off by hand with the bladed scrapers. 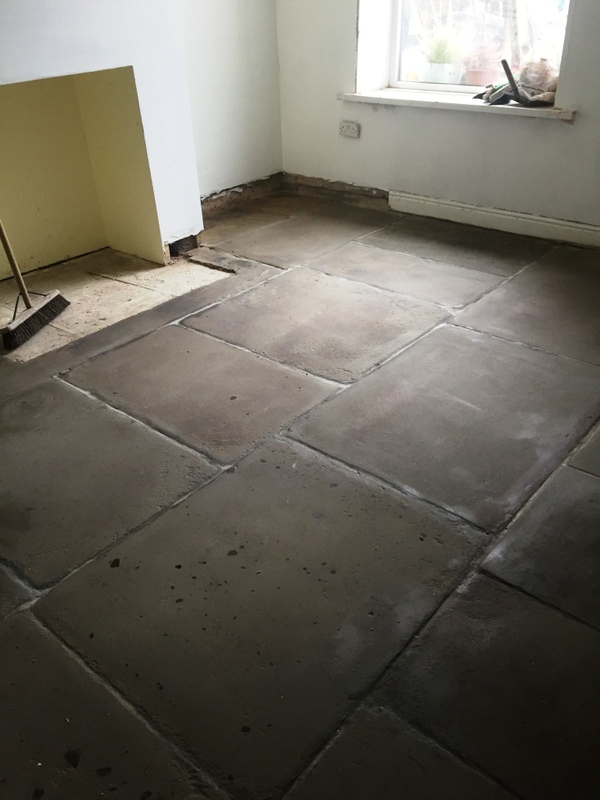 Finally, the slabs were finished using a brush fitted to the rotary machine with 320 grit honing powder to achieve a smooth, silky and very clean surface before being power rinsed with plenty of clean water. 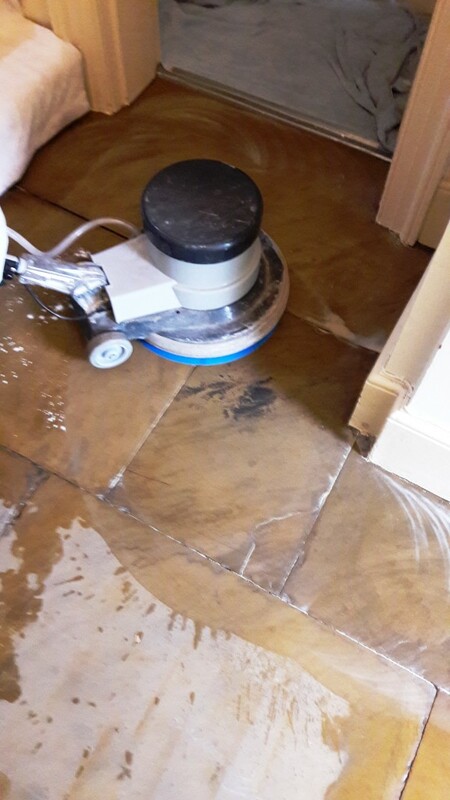 Again, the floor was left to dry thoroughly overnight with the assistance of our large capacity dehumidifier and thermostatic hot air blower. 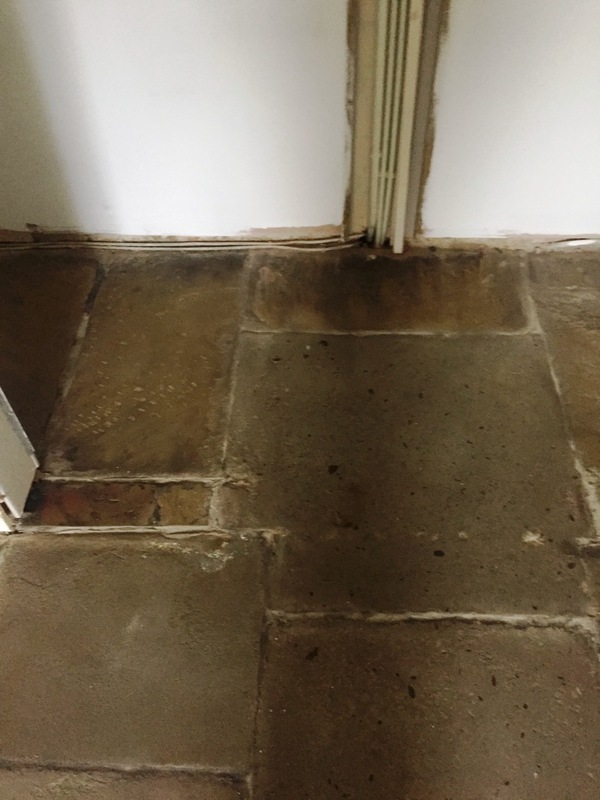 Returning the following day, we found that the dehumidifier and heater had done their job and the sandstone was ready for sealing, the moisture content having been brought down to an average of 10% overall as shown by our damp meter testing. 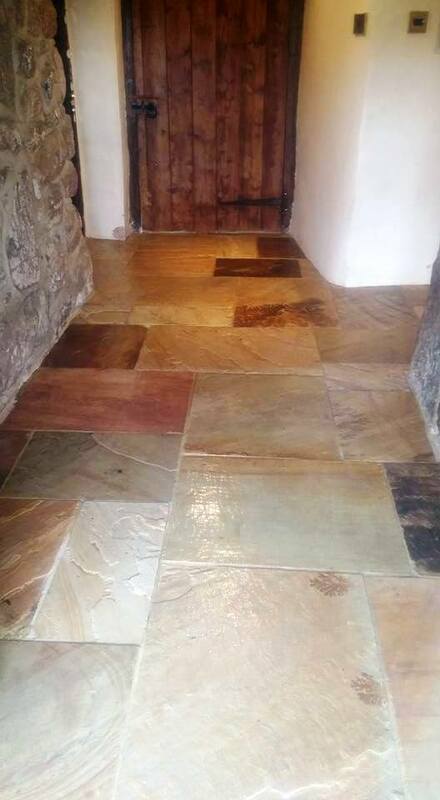 The client had requested a light shine on the floor so that it would be easy to maintain on a daily basis. 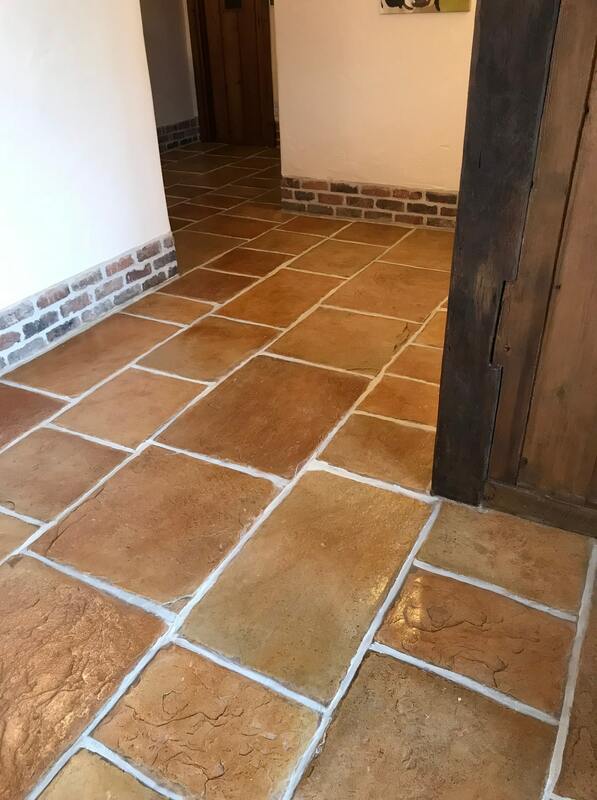 We chose, therefore, to use Tile Doctor Seal & Go, a combination sealer with a mid-sheen topical finish, which we applied using paint pads and microfibre cloths in five thin coats, resulting in an excellent fluid resistant seal with a lustrous shine. This was a tough job but a highly satisfying result, further emphasised when the client’s antique furnishings were placed in situ. In an interesting turn of events, I was recently contacted again by a homeowner from Guiseley, near Leeds, with whom I had been in touch with two years prior. 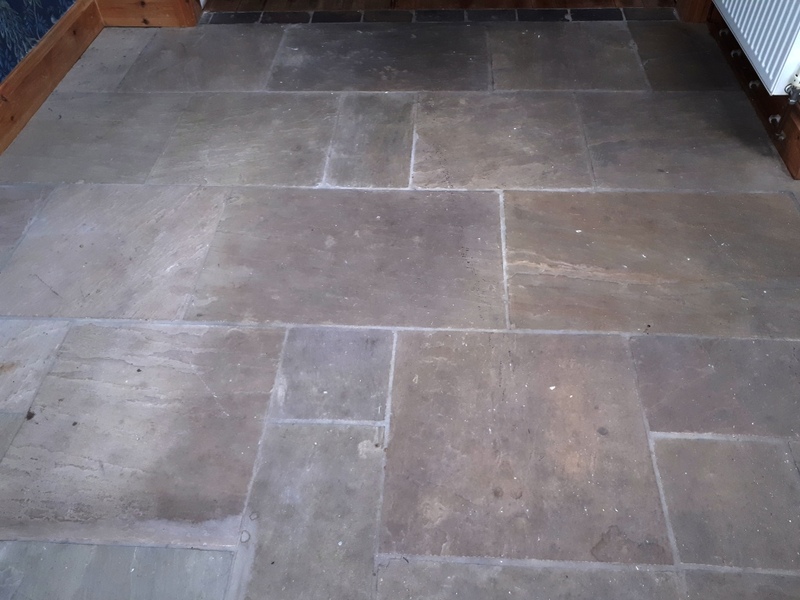 At that time, I had quoted for cleaning and maintenance work to be carried out on a Yorkshire Stone, or ‘Yorkstone’ tiled floor, but the customer had opted to go with a different company. Yorkstone is a variety of Sandstone that it unique to the quarries of Yorkshire. When the customer called me again, she explained that the previous work – most likely carried out by inexperienced cowboy builders – had been disastrous. 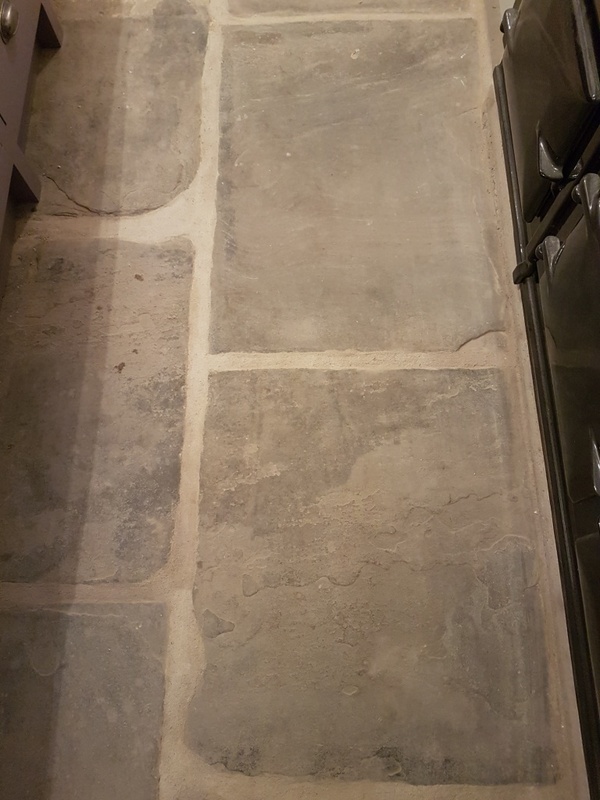 The stone evidently had not bene properly cleaned and very little sealer had been used to protect it against wear and tear. 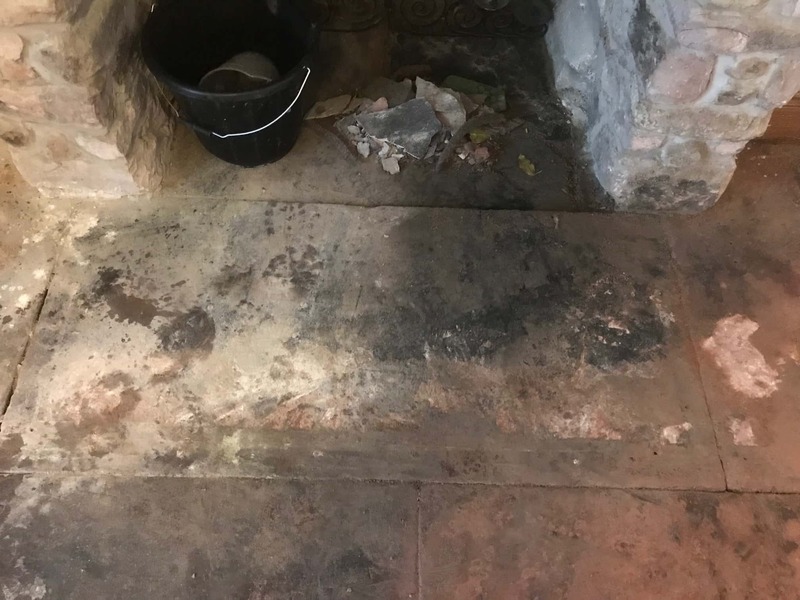 The result was a very dirty and dusty floor – and the only solution was to start the restoration process over again, this time with the help of a true professional! 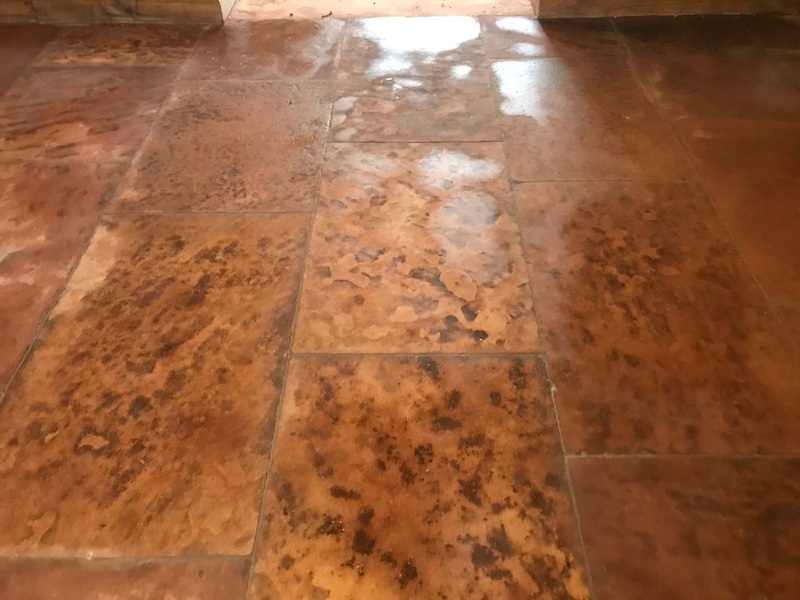 Since the floor had not been cleaned properly to begin with, there were several unsightly paint stains on the stone in addition to general dirt and stains. 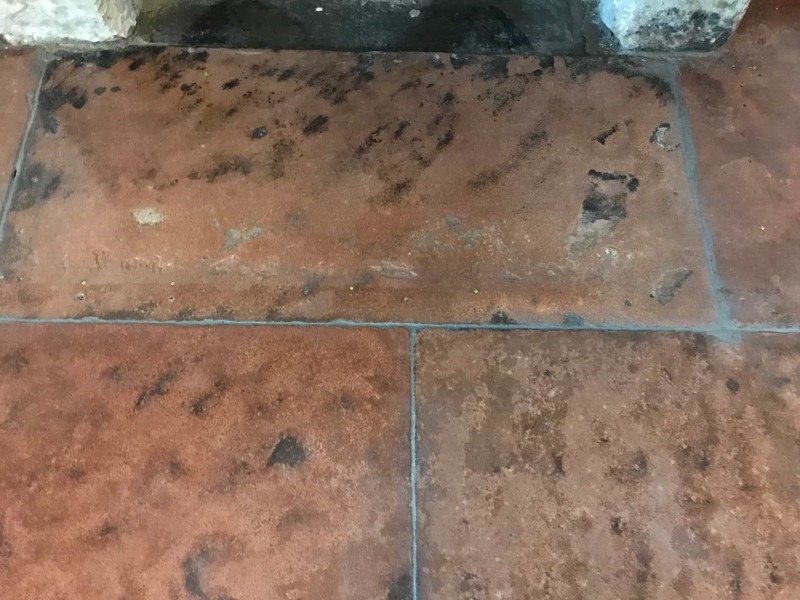 To remove these, I applied Tile Doctor Pro Clean, which is a reliable alkaline cleaner, liberally across the floor and left it dwell for a short period. I then used a wire brush to scrub away the muck. 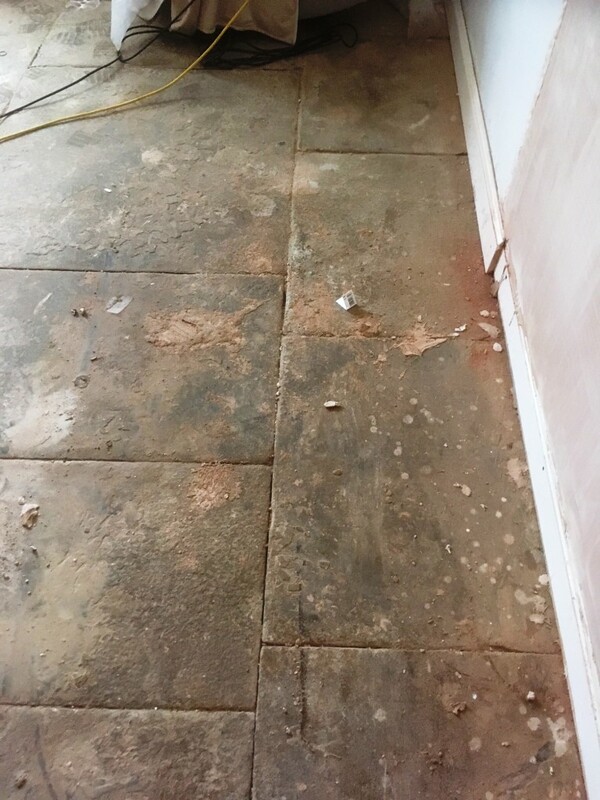 The customer had asked the builder to grout the tiles to reduce the likelihood of trapped dirt and make the floor feel complete. 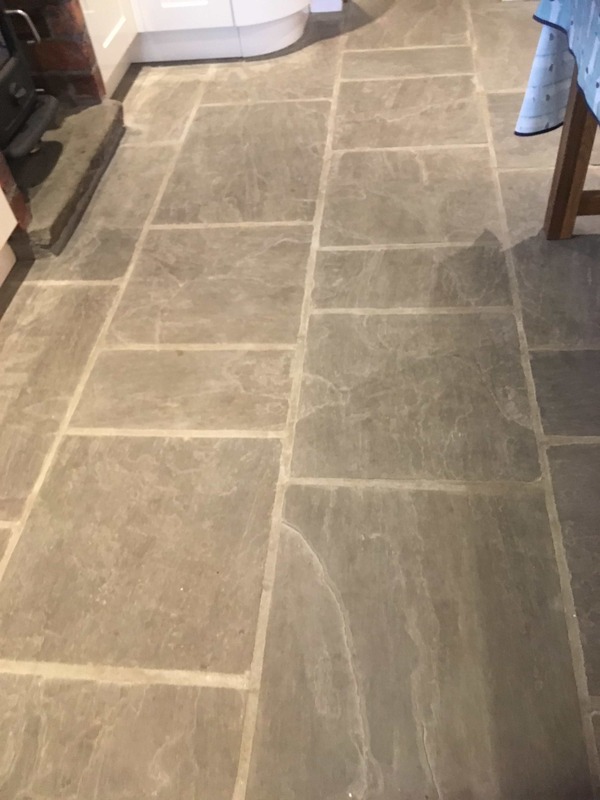 For whatever reason, builder either wouldn’t or couldn’t oblige, so I grouted the whole floor as well, much to the customer’s delight. 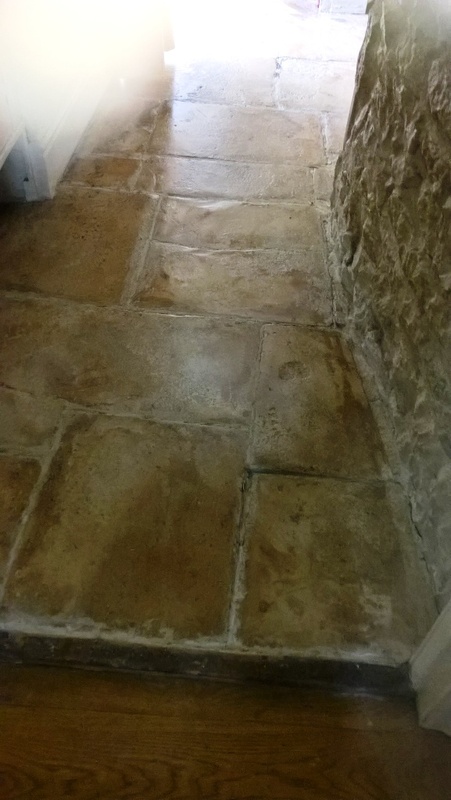 Once the floor was fresh and clean, it was left to dry completely so it could subsequently be sealed. 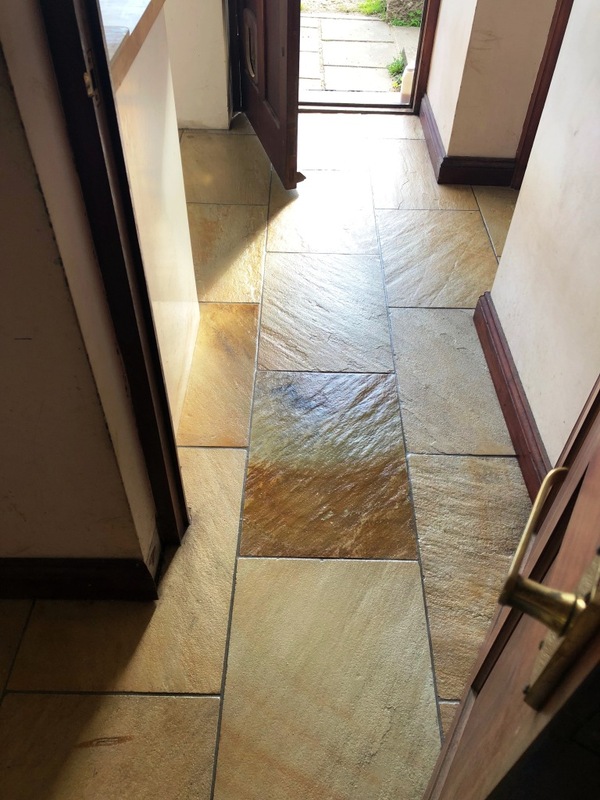 My choice of sealer was Tile Doctor Seal and Go, a topical sealer which provides both a stain resistant surface seal and a durable and aesthetically-pleasing low-sheen finish to really enhance the character of the stone. Four coats of sealer were used in total to ensure maximum protection. After cowboy builders had botched the job, the customer was exceptionally happy that the situation had finally been put right. The floor is now in top shape and will be protected against wear and tear for a long time to come.